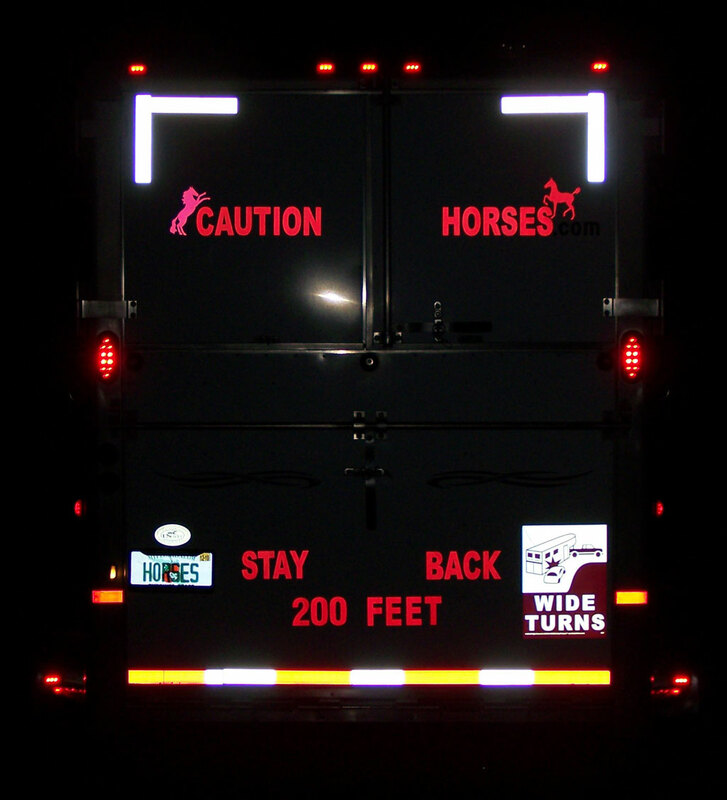 "How do you want other drivers to see you at night?" 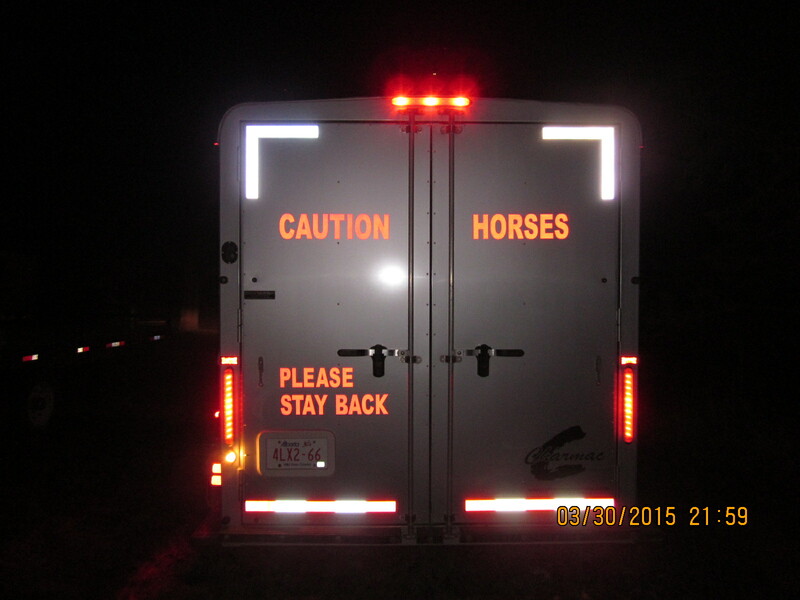 "As soon as I turn the corner onto my road at night, I can see The Horse at The Cross, more than 300 yards away." "The only one of it' kind in the WHOLE WORLD! Do you want to join me?" "Here it is and I think It looks great." 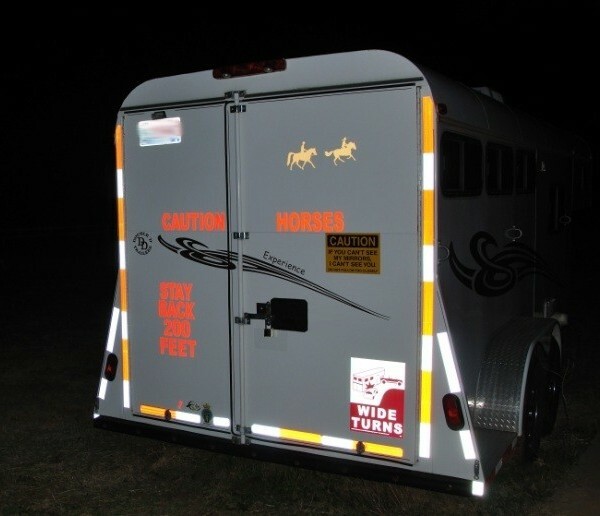 "We love this product, the decals give us great peace of mind especially on winding back roads when every moment counts! 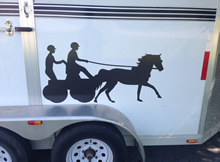 They look so nice on the back of the trailer too." "My Adam trailer came with DOT reflective stickers but I always thought that the back of it looked like a cargo trailer. 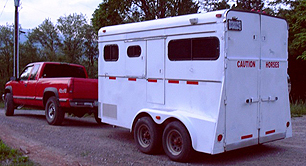 After getting tail-gaited while transporting a new horse, I was resolved to find something to make my trailer unique and make it evident that it is a horse trailer. I found your site through a magazine ad and I placed my order the next day. 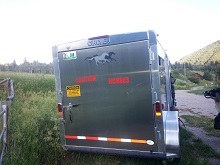 Now that the stickers are in place I notice that people traveling behind my trailer are keeping a greater distance and people have commented that it sets my trailer apart from others. You have a great product and great service. Thank you. " P.S. Again I appreciate your service and you have a fantastic product. "My Trailer looks great and my little mule is safer on the road!" 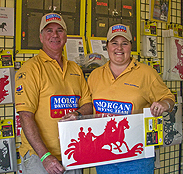 "They were so easy to apply and look very effective, so I’m very pleased with them. 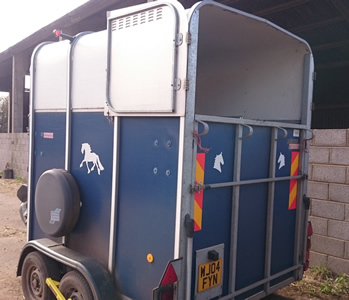 The majority of people where I live use Williams Trailers, so when I go to an event now, its much easier to spot my trailer in the car park! 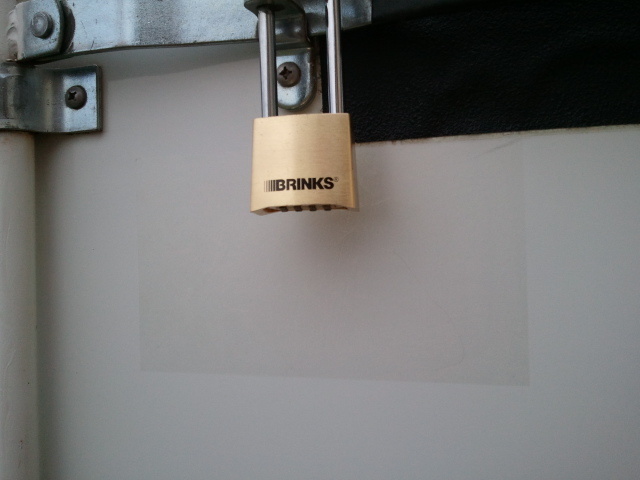 Also means I’m less worried about someone trying to steal my trailer. 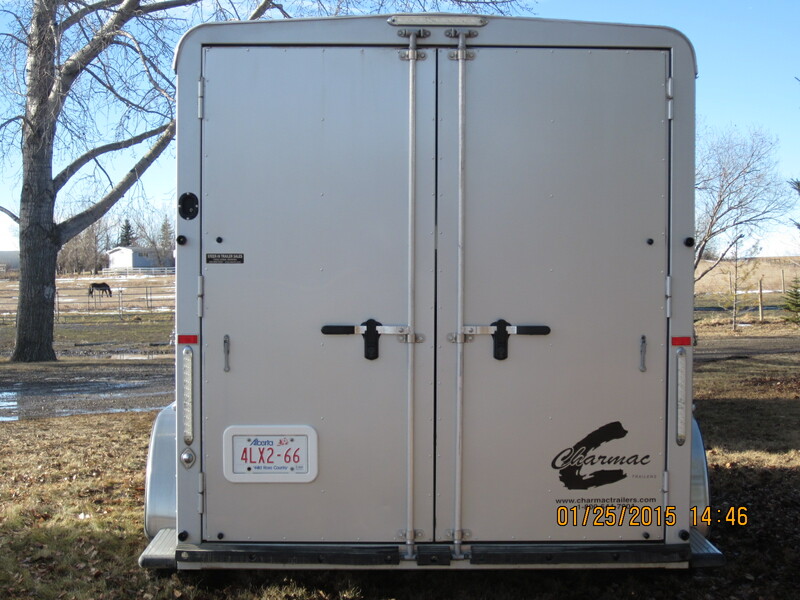 Police and insurance companies are encouraging people to personalize their trailers in a bid to discourage thieves, so I think these decals are excellent for that purpose." 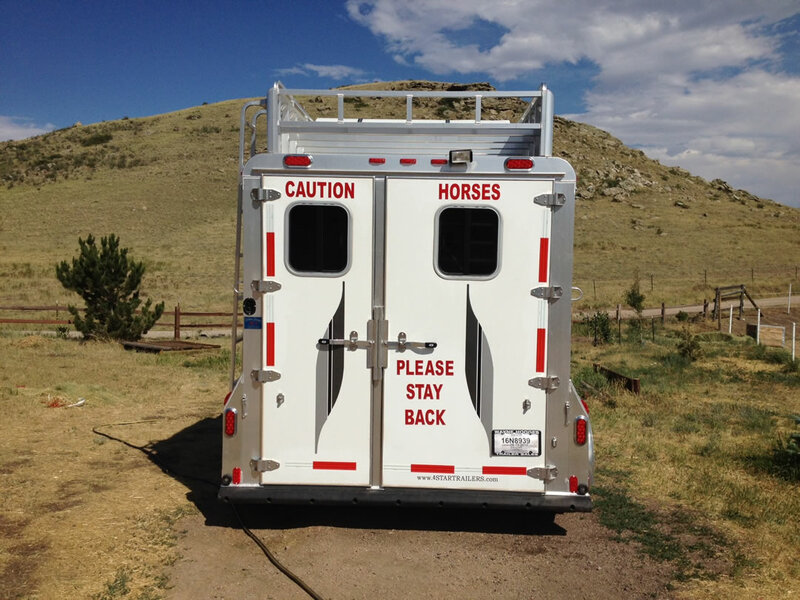 "My one job when hauling my horses is to keep them safe and I feel that the decals will definitely help. They were easy to apply; though I admit I was scared to death of messing it up. Thank you for your input and assistance. 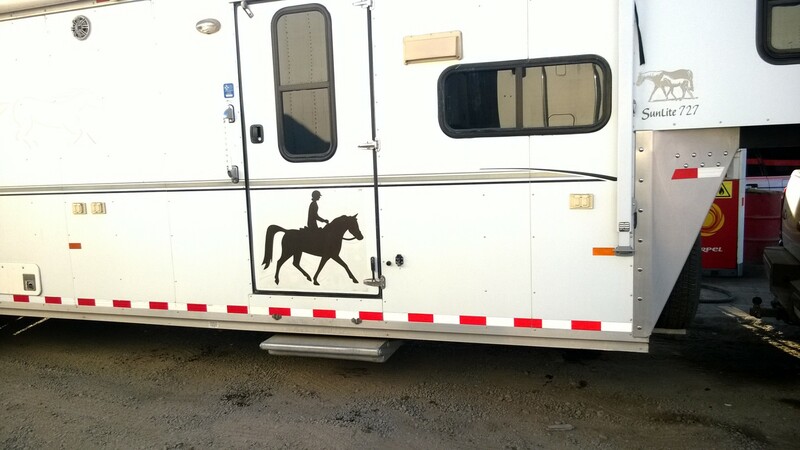 The picture of the back of my trailer is now my screen saver. 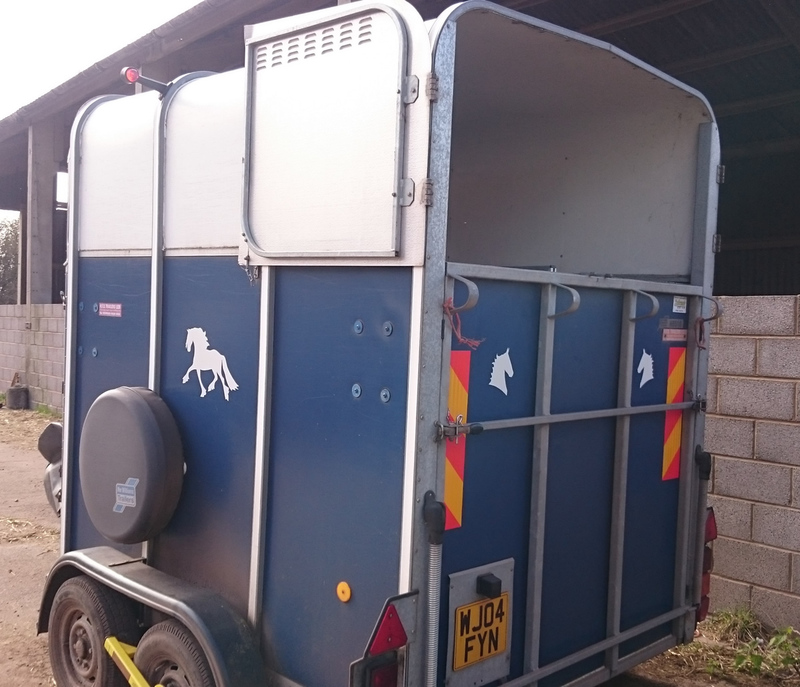 What a difference the decals make, thanks so much for them." "First, thank you for calling to confirm I received my first order, and taking my second order over the phone! 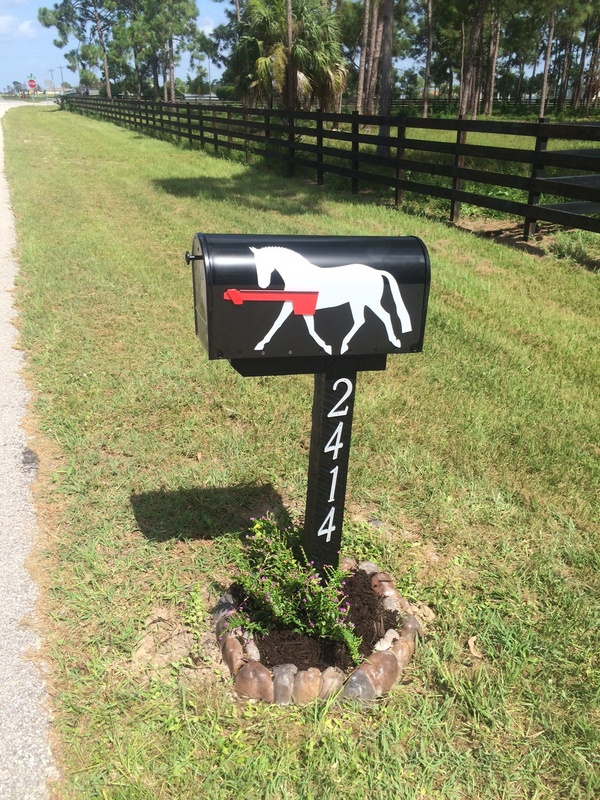 This is exactly what I pictured our mailbox looking like. 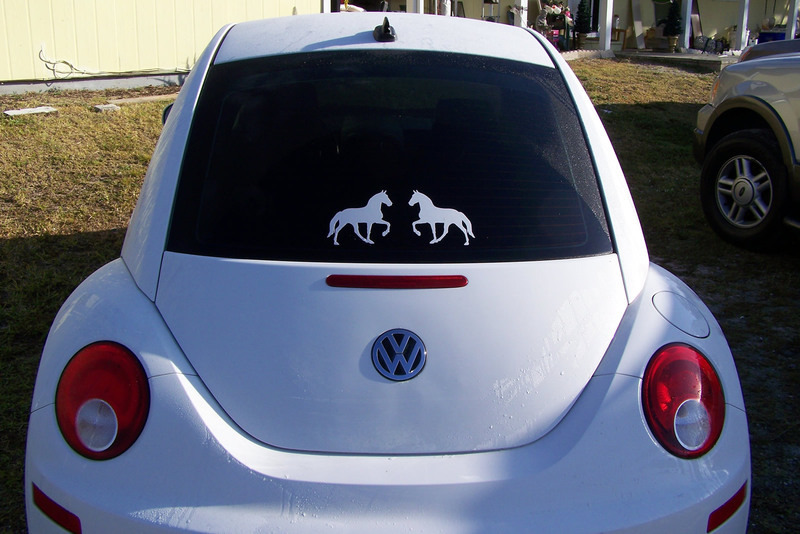 The decals are such wonderful quality, and you were so very helpful :) "
"Great decals. Super easy to apply. 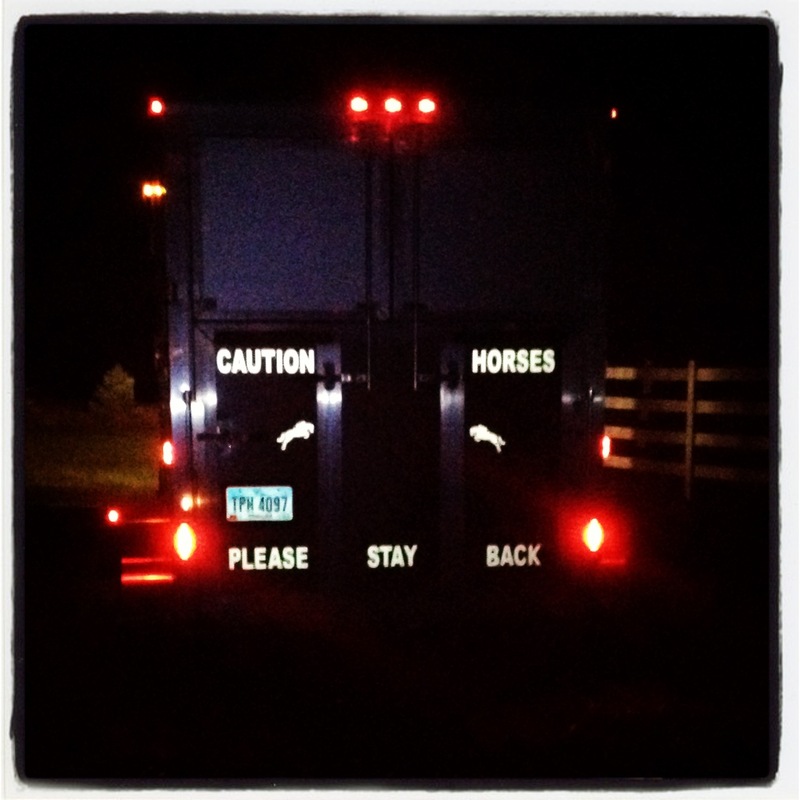 They make my precious cargo way more visible on the road. 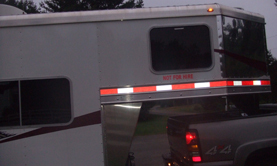 Look at how much the visibility had improved, even when it's parked! Thanks! You will see me order again! " "Hey guys! Sorry it took me so long to get my decals on but I wasn't sure where to put them on my car and I was going to get a new vehicle but ended up not." "I love the decals and found that they were super easy to place and attach to the trailer. 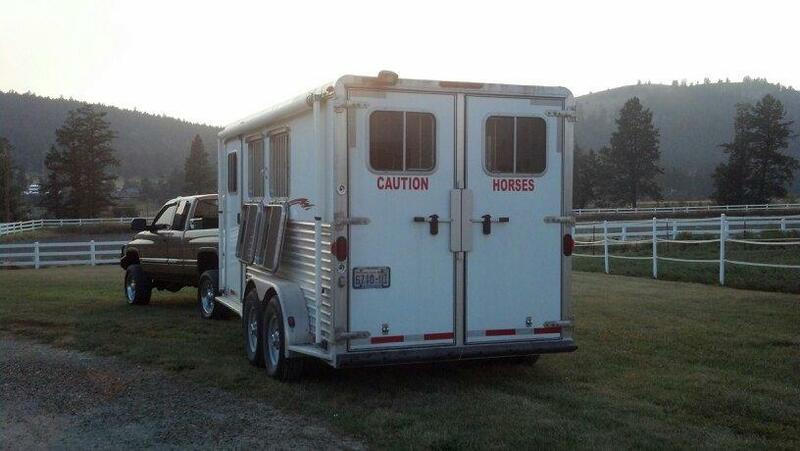 The moment I get a truck I will be placing my order for "caution" stickers as well. No way am I hitting the road without being more visible. And after trying these the choice is clear." "Thank you so much!! I absolutely love how they pop out on the trailer. Easy to put on (minus the weather not cooperating) and they look great!!! 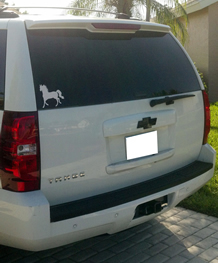 Will definitely be recommending all of your products to anyone :)"
"These decals are very easy to apply. I think you can see by my broad smile I'm really happy with the result!" "It all looks great as expected! 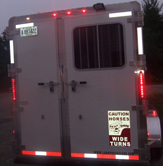 I have ordered from you before, but I recently sold the trailer that all the reflective signs were on. 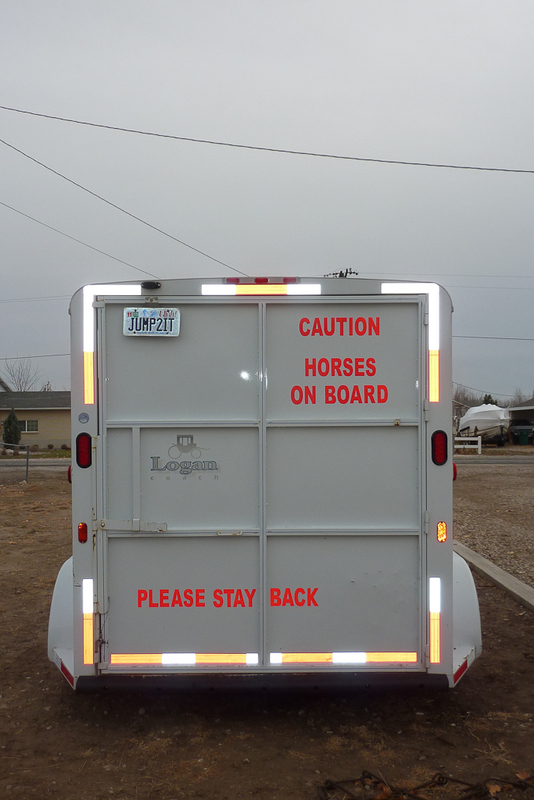 I refuse to drive my new trailer without the CAUTION HORSES reflective signs on it first! 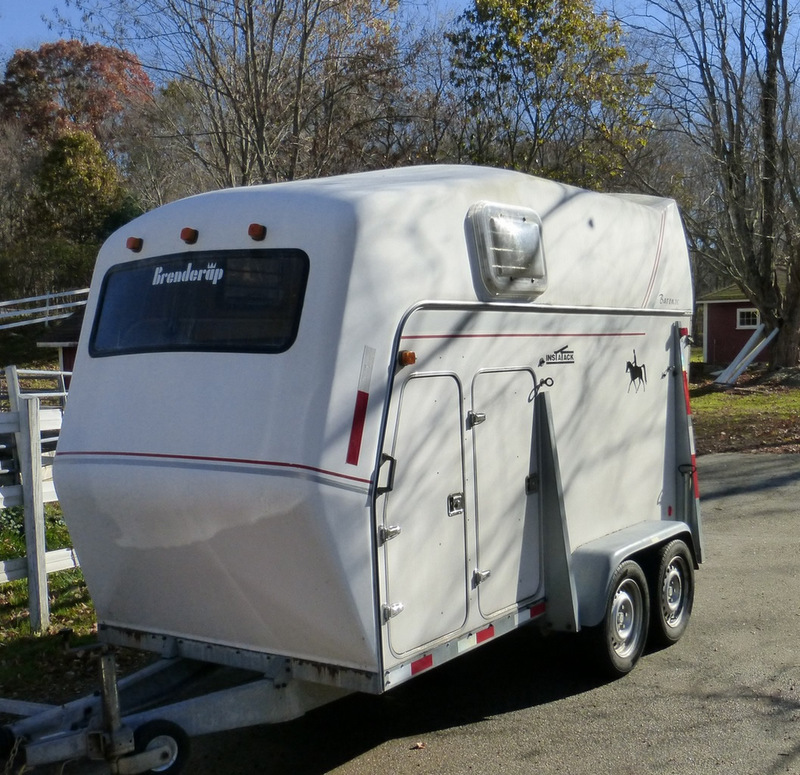 My new trailer has no rear windows so it looked like a construction trailer from the rear (as you can see from my before photos). 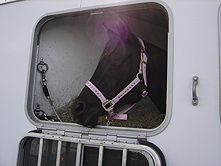 Now, there is no doubt about what the trailer holds inside and I have no doubt that it helps other drivers to be more aware of my precious cargo! Thank you for the great product as well as your great service! I always recommend your signs to my horse loving friends!" 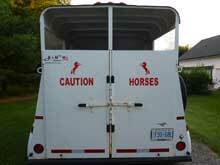 (4" Tall CAUTION HORSES ON BOARD PLEASE STAY BACK & D.O.T. Reflective Strips. 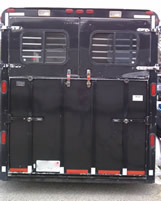 "This is my second set of horses on my vehicle. I just love my gals. " "Thank you very much for your help." 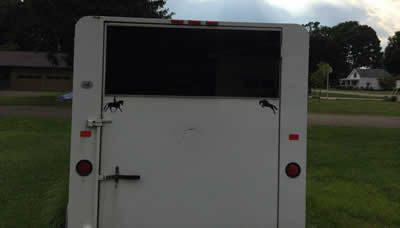 "Here is a picture of your stickers on our new Shadow trailer. They go perfect! 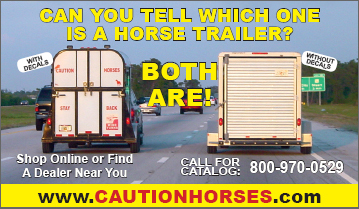 I already had people from the barn ask me where I got them, and a week later they already had them on their trailer too! " 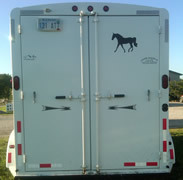 "Attached are some photos of our trailer with all the decals. After getting them on I couldn't wait for night to fall to test them out. They work like a charm. 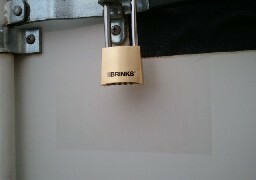 We even used one of the clear cover peel off stickers to place under where the padlock hangs down to prevent scratches (did paint touch ups there to many times!). 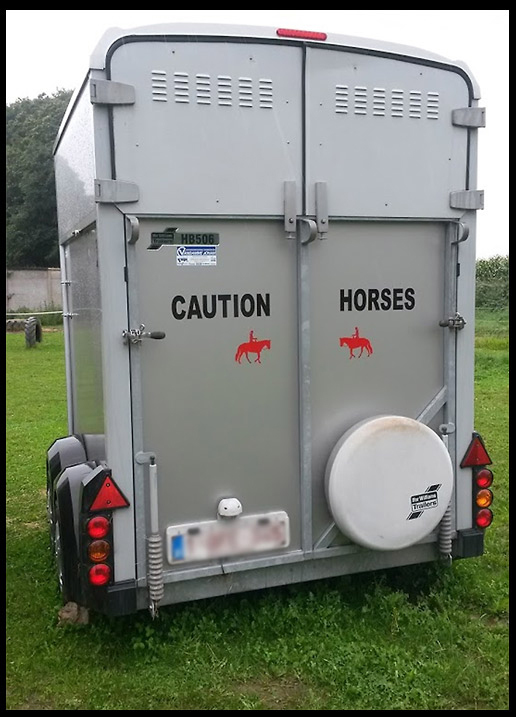 While I wish more of today's drivers had enough common sense we didn't have to plaster huge red stickers everywhere, I am so glad to have found quality decals that help remind people to keep back. 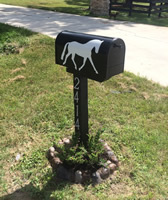 It is also really great you provide decorative reflectors to add a more personal touch. It was really neat when you called to advise me we had actually ordered too many strips, not many businesses would personally call a customer to be honest like that. You saved us money and earned our respect. 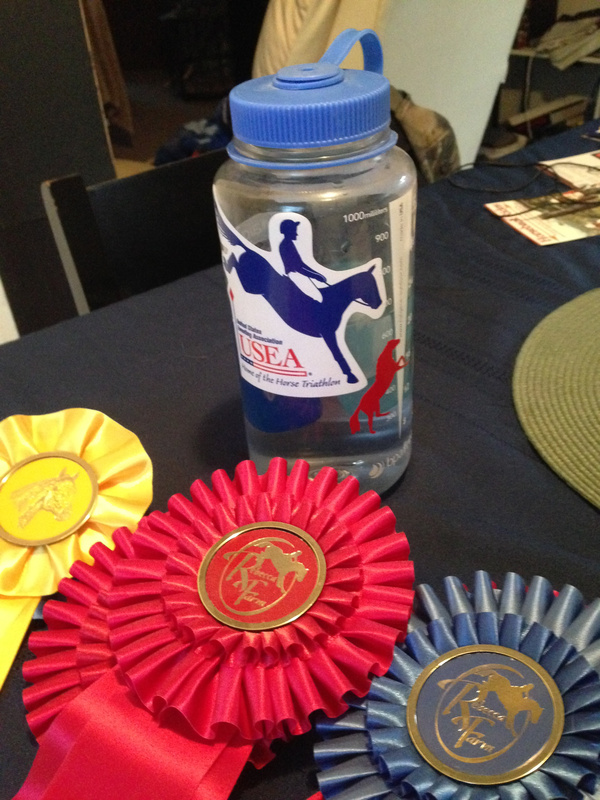 A few people have already asked where we got these and I make sure to send them your way." 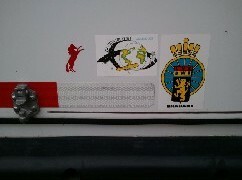 "When we wrote to let them know the sticker mirror had cracked and peeled they wrote back and sent us a new one. My original e-mail had only been to let her know, I felt that 4 years was plenty of life out of a basic sticker and was planning on ordering a new one. The rest of our order, all the reflectors, have held up perfectly and still look and reflect like new. Thank you for the great customer service! " "The decals look nice and pleasant and the D.O.T. stripes apply easy. Safety first, cause my girl needs to stay safe. " 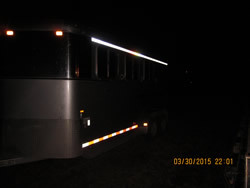 "I have recently purchased your reflective decals for my trailer. 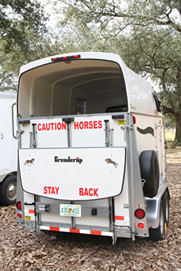 I am very happy with the quality of the product and I hope my horses are now safer on their trips! 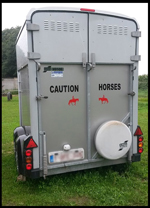 It is very hard, if not impossible here in Europe to find reflective signs, so I was very happy that you ship internationally and I could order the decals from you. 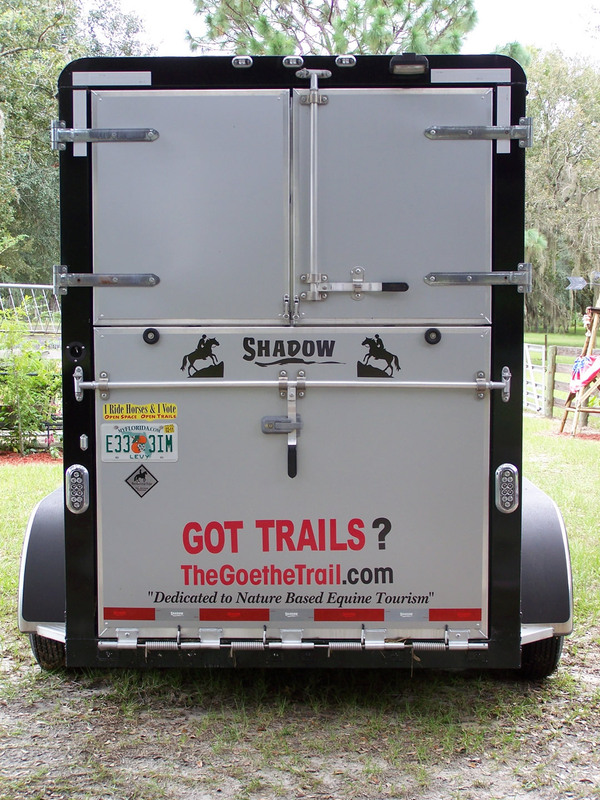 I would definitely recommend this to my horsey friends!" 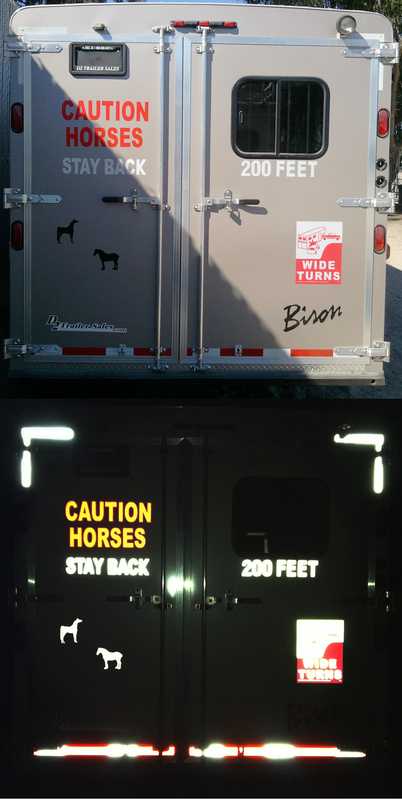 "It is clear from the attached photos that "CAUTION HORSES" reflective decals are far superior to the ones that I had acquired locally from a very reputable and widely used company. 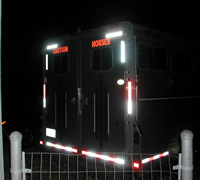 I am a member of a mounted search and rescue team and it is important to me that my equipment is highly visible both night and day, as we can be called out at any time. Your product has contributed significantly to my peace of mind when transporting my horse. Thank you once again."." "The "CAUTION HORSES" & "STAY BACK" lettering, "WIDE TURNS" sign, and D.O.T. 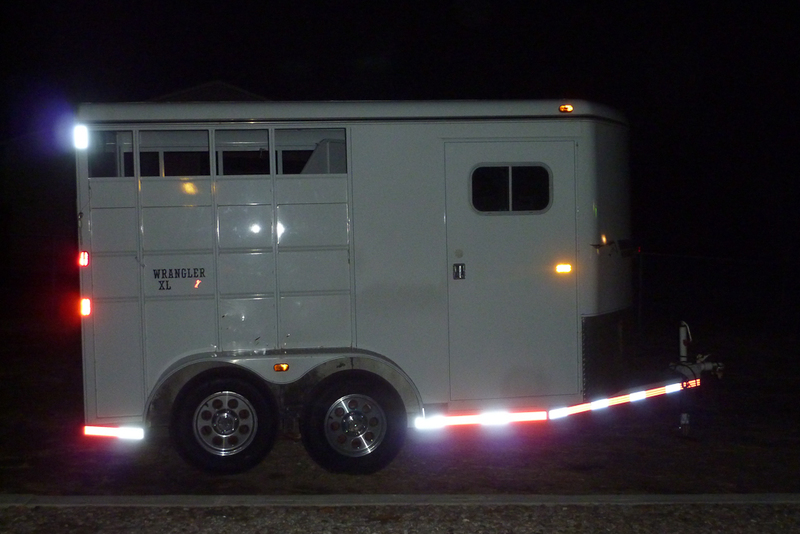 reflective strips fit perfectly on our horse trailer and I feel so much safer now when hauling at night!" 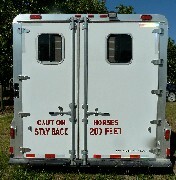 "Thank you so much for suggesting the "STAY BACK 200 FEET". 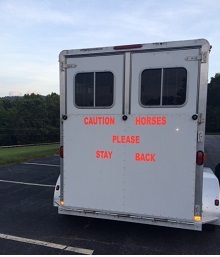 I feel like it really does help keep others from tailgating. 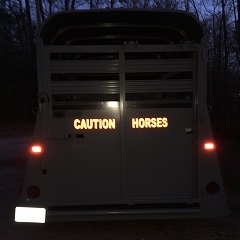 I also love my "HORSES CAUTION" reflective wording. 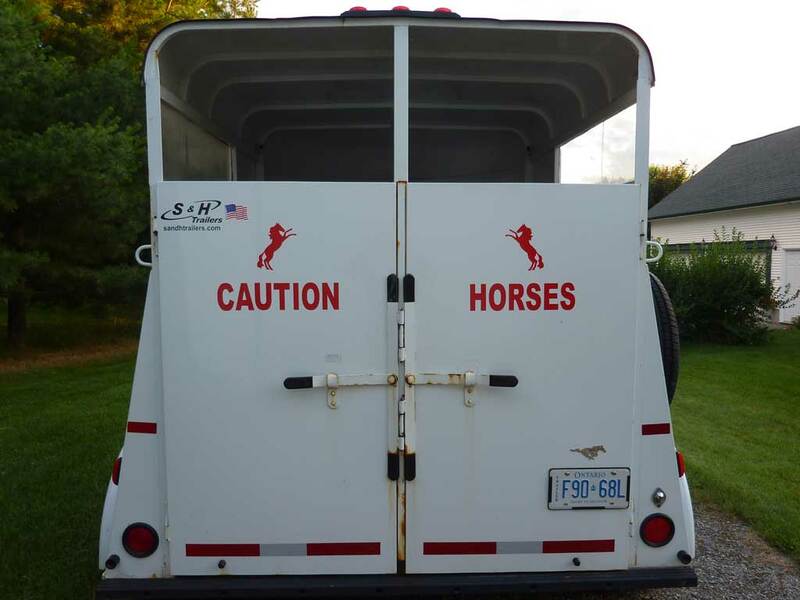 I put it backwards (instead of CAUTION HORSES), as I thought it might be more eye catching. I liked both the black for day, and the white for night, and decided to layer them together. I am thrilled with the products, the results, and your customer service." 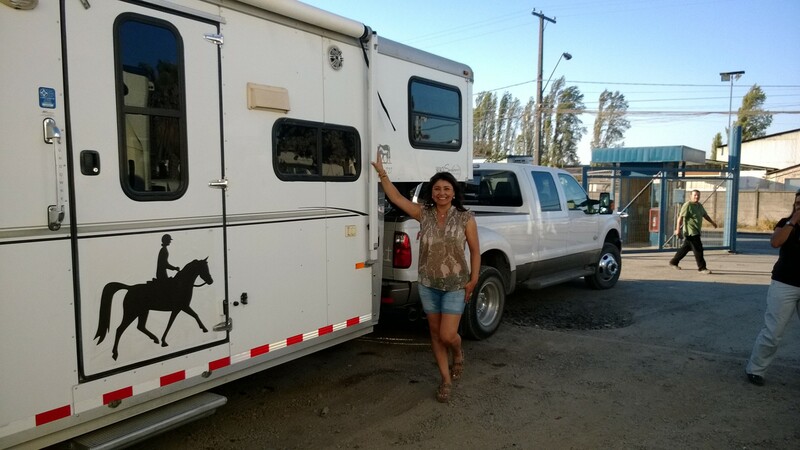 "My trailer looks great and now I don't worry about the people behind me so much. " 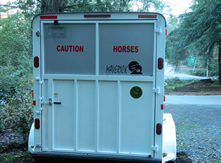 "Our horse did not even set hoof in our new trailer without the CAUTION HORSES decals on the back! 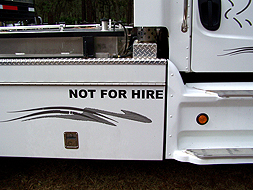 That extra reminder to other drivers is an easy and effective safety measure. 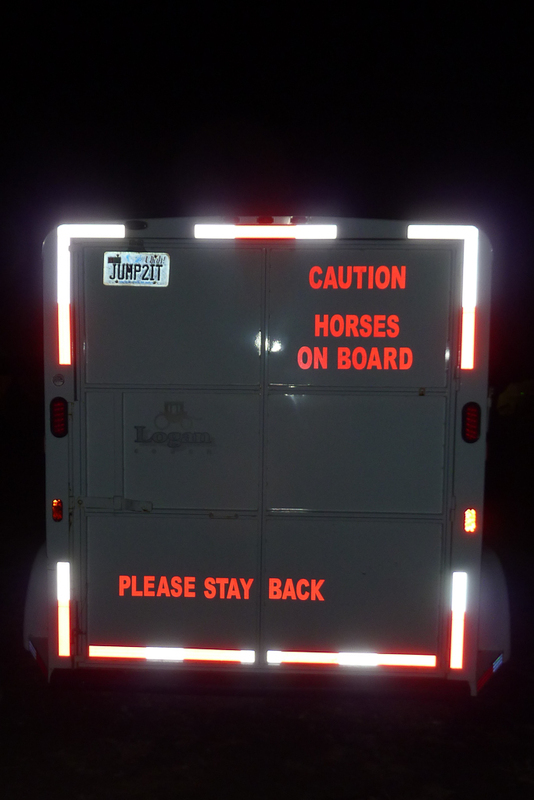 Just by using the flash at dusk, we could see how super reflective the letters are. 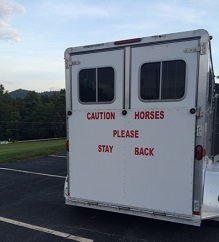 We appreciate the "PLEASE" option as well! " "I ordered your reflective stickers after driving through San Francisco one afternoon with my horse to go camping at Pt. Reyes. Drivers were very impatient with my rig to say the least. I saw your products on other trailers at horse camp and decided I needed to remind drivers what I was towing. 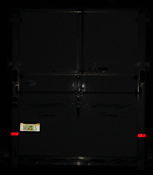 I get much more room and respect from most drivers now that I am reflective and identified. Thank you for a great product!." 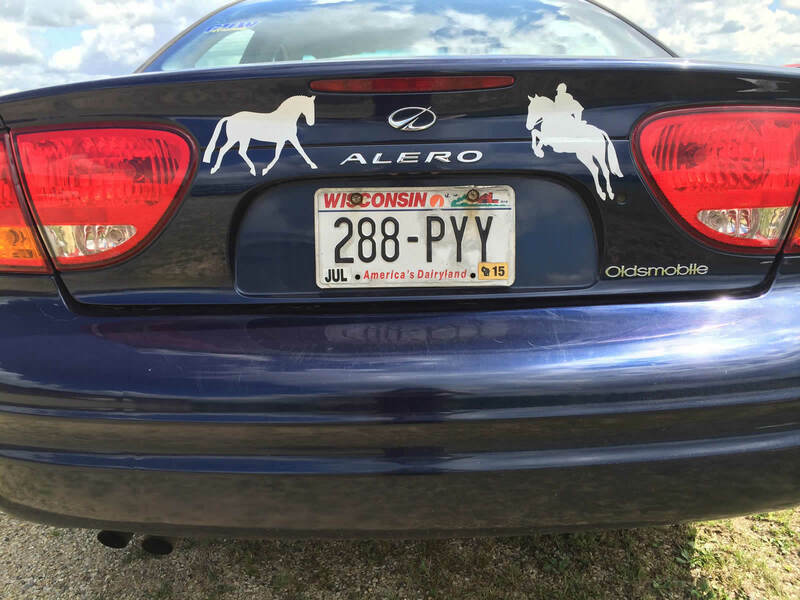 "The Decals look great, I love them and you can really see them!" 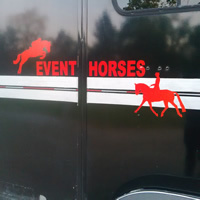 I have been looking all around for Draft horse stickers and was really excited to find your company. Cant wait to get my next ones to put on...Thanks again for everything"." "Here is a copy of the photo of our last purchase. " 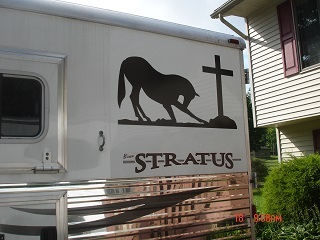 "I recently purchased several of you decals and am sending you a picture of them, as you requested. 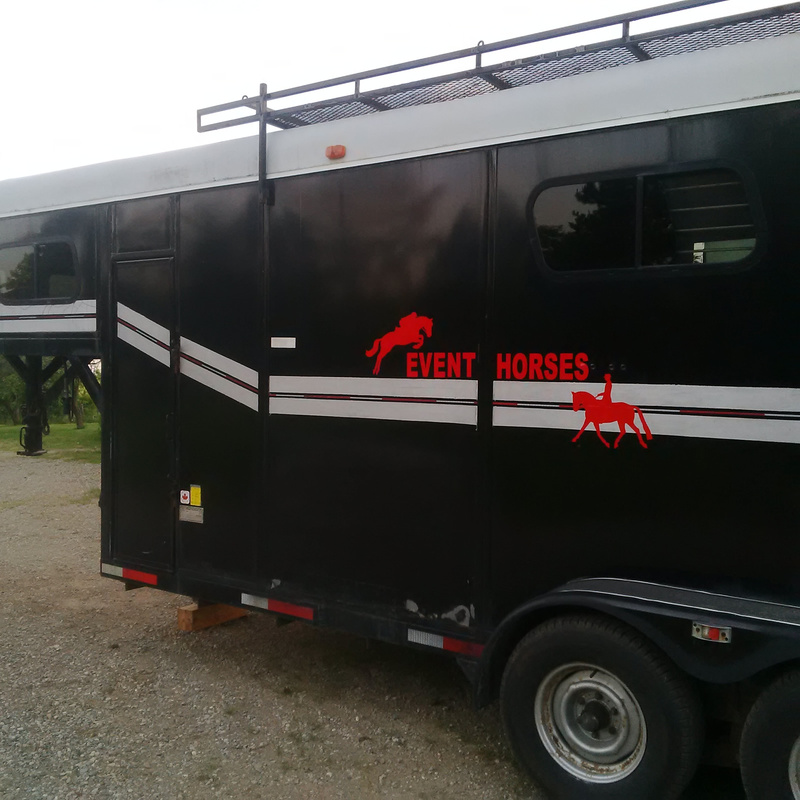 The decals look great! 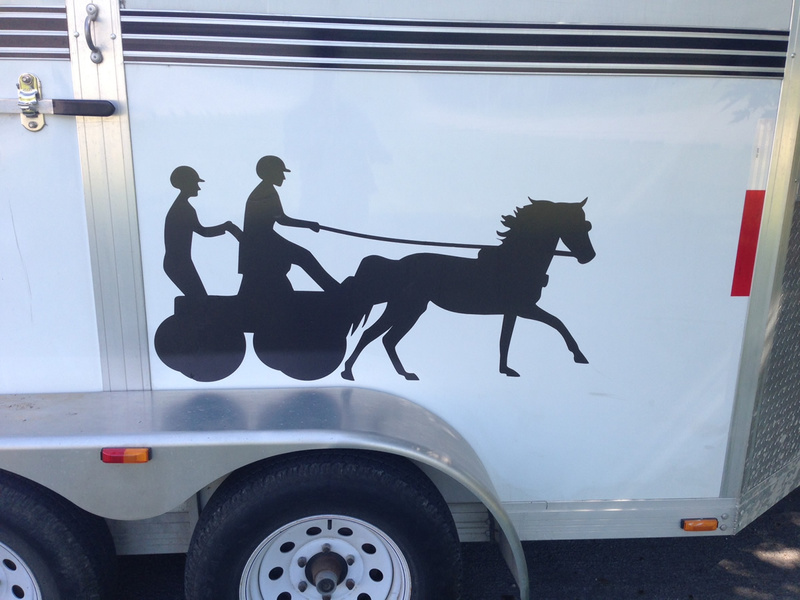 They look like came as part of the trailer package when purchased. 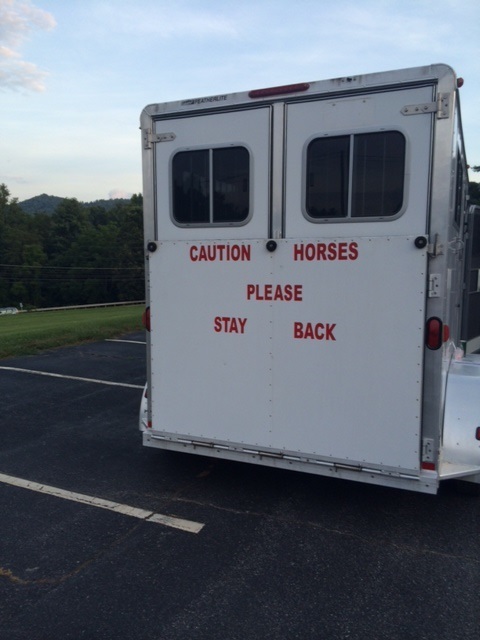 They should help keep the tailgaters aware...we hope! 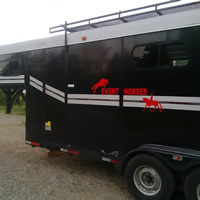 My horse even enjoyed helping me apply them, so if they look a little crooked, it's because he and my other animals just had to see what was going on. " 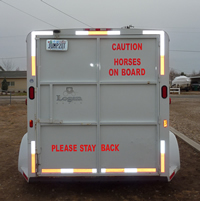 " I love my new reflective decals on my new trailer! 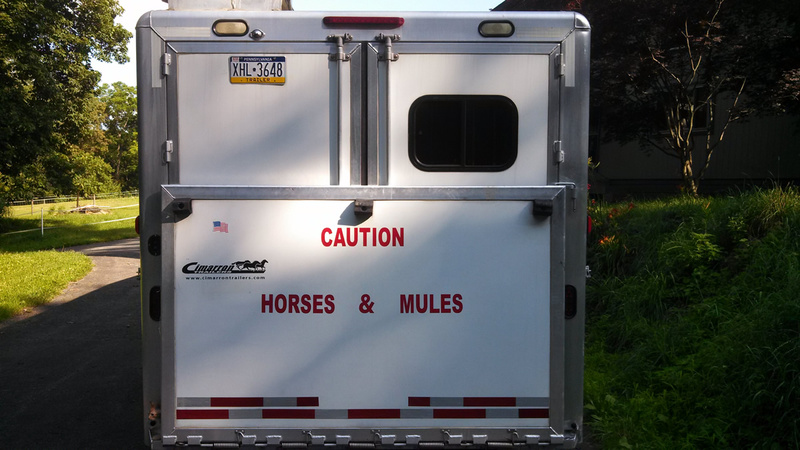 Now both my horse and mules are represented. 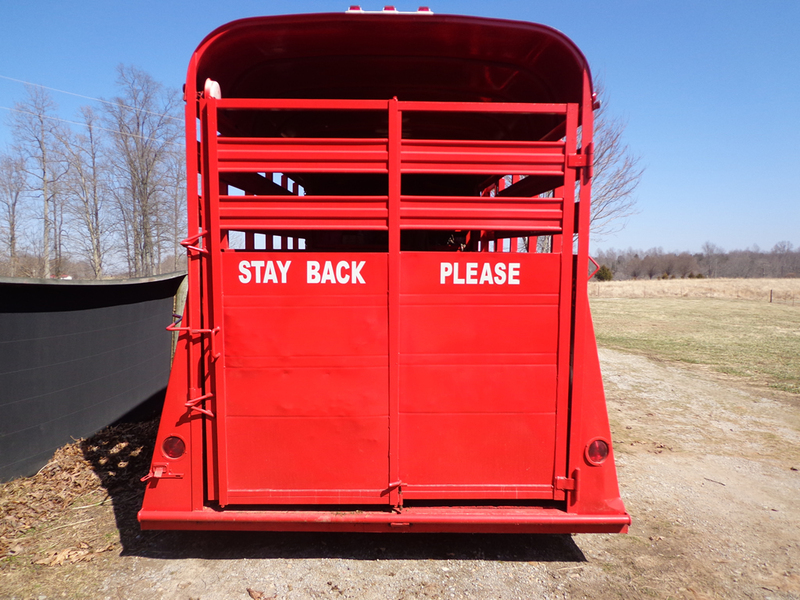 People always look as they pass to get a glimpse of those large ears." "They look great! 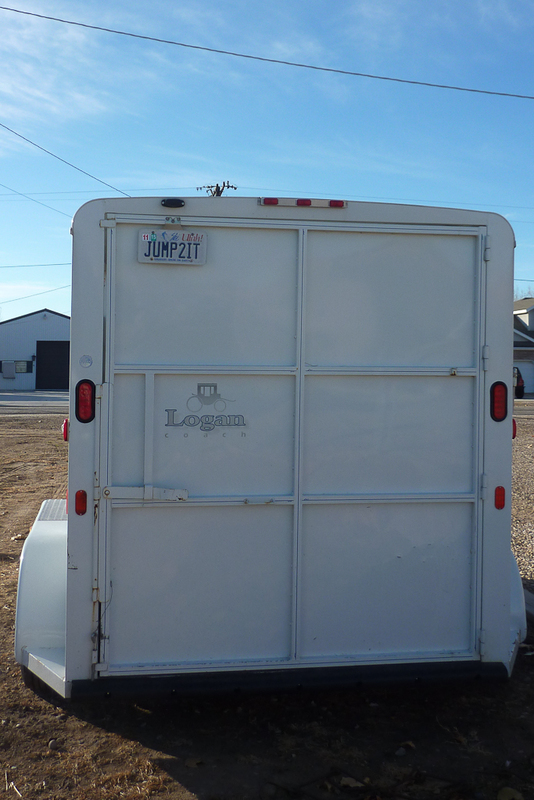 And they were very easy to mount on the trailer. 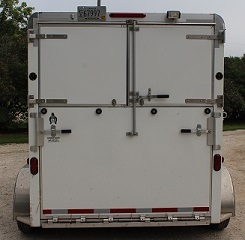 While the "Baron trailer" did come with reflective decals along the lower portions of the back & sides, I feel better having added more reflective decals that are higher up. 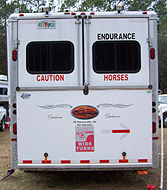 I'm enjoying the personalization of the large endurance rider decals on either side, and I pat myself on the back for finding the perfect place for the little red decal which happens to be a perfect color match on my trailer." 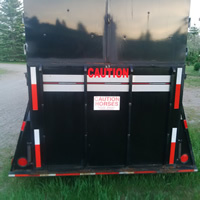 "I received the decal in perfect condition, it fit nicely where I intended it to be and I believe it helps drivers pay closer attention when following us. 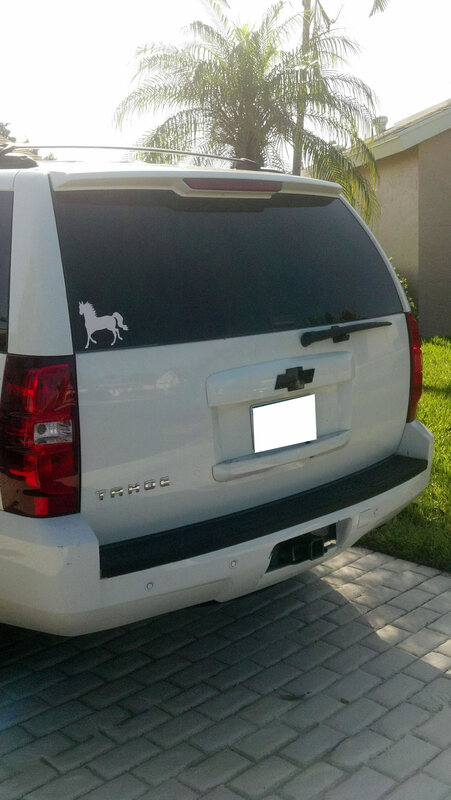 Very nice, thank you "
"I really like my decals." "My trailer is grey and looks like any old construction trailer, so I'm very pleased with how the decals change the look of the trailer and how they advise drivers of the trailer's valuable contents!" 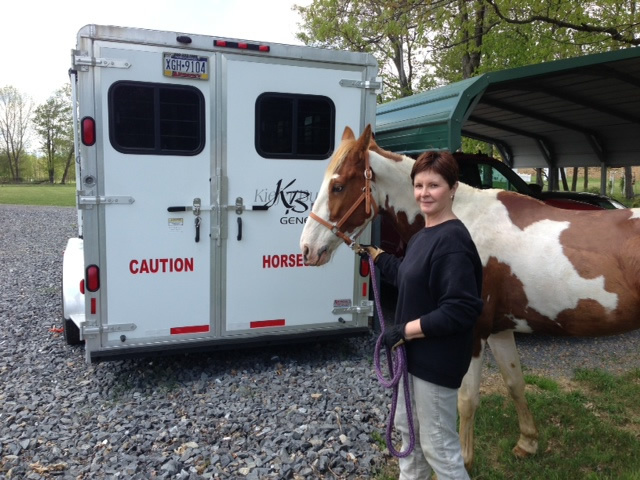 "I wanted to extend my gratitude to Deborah for this wonderful transaction. 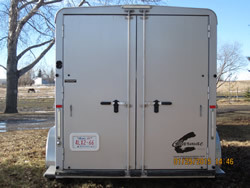 Your company made our order SO easy and seamless. I ordered exactly what we wanted online via my cell phone, through PayPal, got my decals in super quick time, and in amazing packaging with a nice note and even some change that I was owed from a readjustment in the calculations. 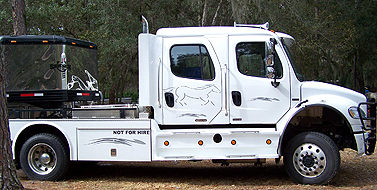 It is so nice to work with a company who takes pride in what they create as well as how they work with their customers." 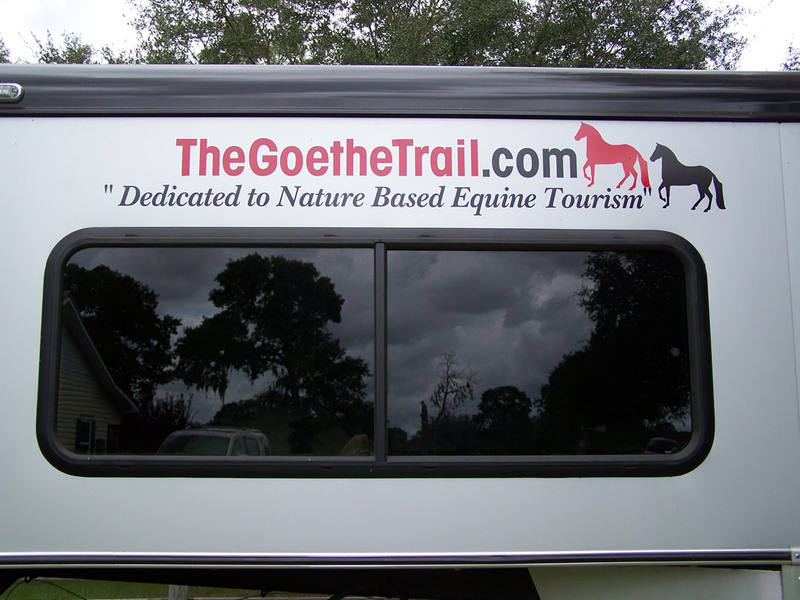 "We love the decals and what they do for the visibility of our trailer. 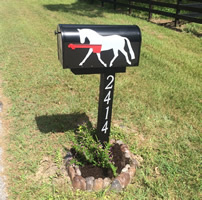 They were easy to apply and look great! 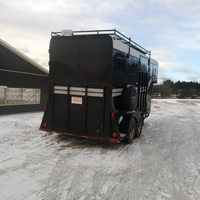 Everyone at our barn has asked were they can get some too." 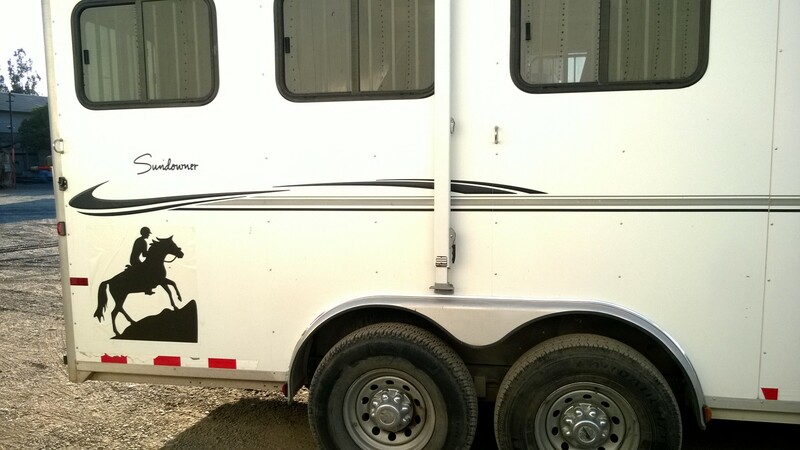 "I am sending you a picture of my trailer with the decals on, I love them, I have one of the horse decals on my truck, too! 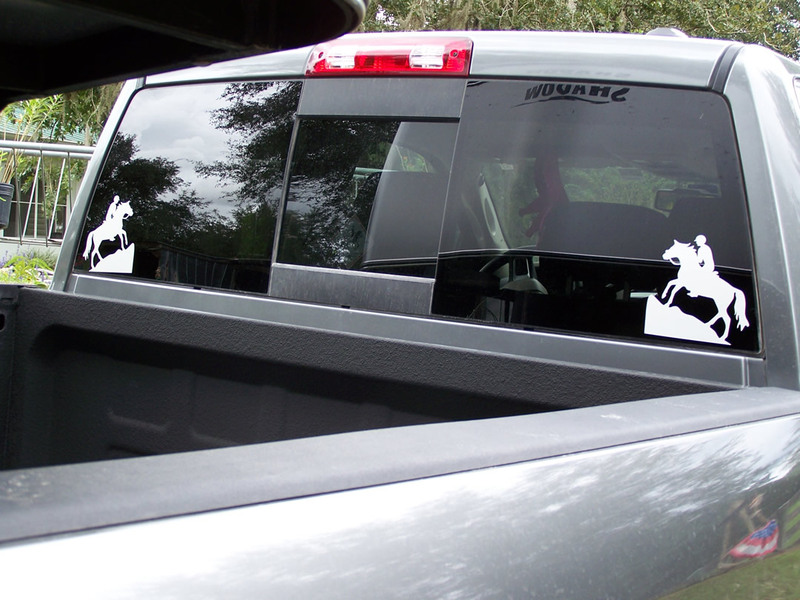 The white looks great on the tinted truck window.They look so great! Thank you. " 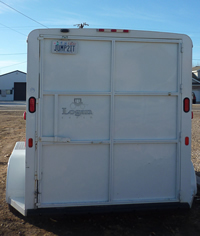 "I think the product is effective and looks great on the back of the trailer." 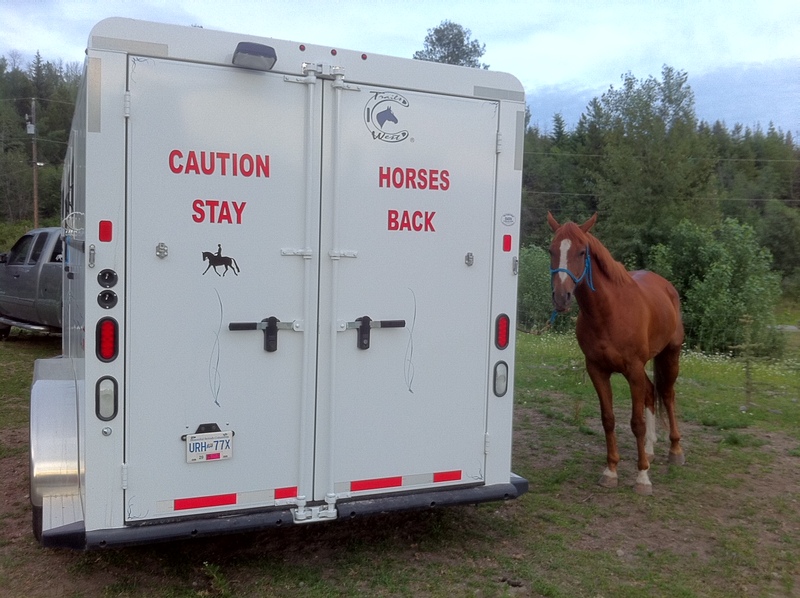 "I fitted my whole trailer with CAUTION HORSES Safety Products." 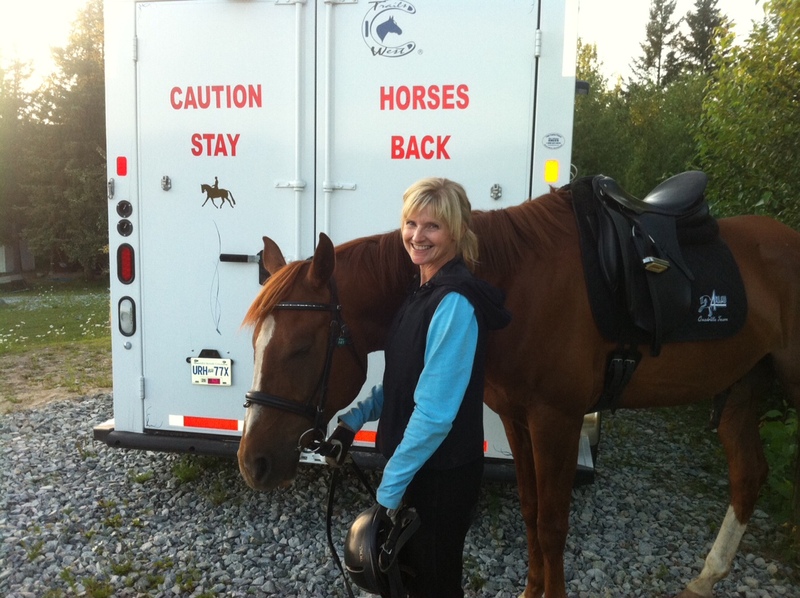 "I have known Deborah and CAUTION HORSES since she started the business in 2000. 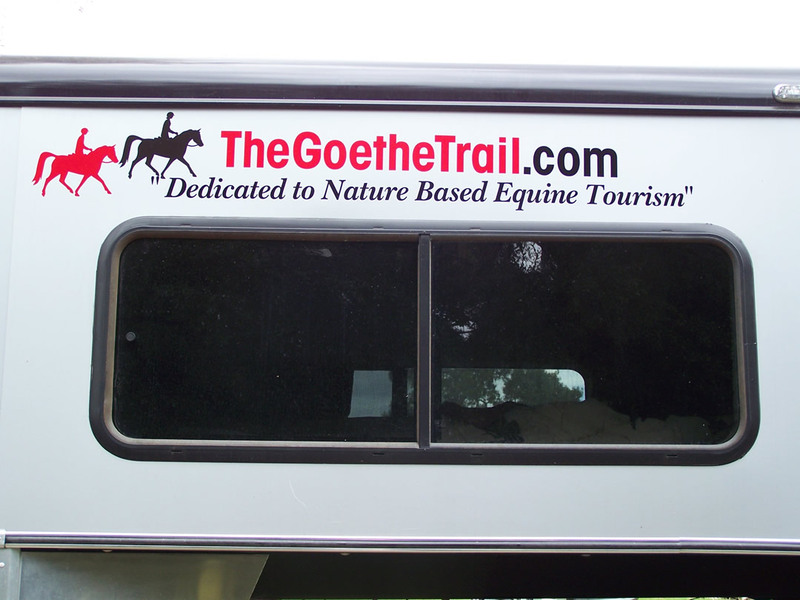 I just recently purchased a new truck and trailer and with the help of CAUTION HORSES, I outfitted my rig professionally with my Non-profit - TheGoetheTrails.com. 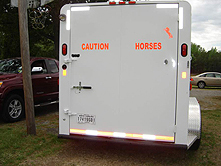 I recommend CAUTION HORSES to all my friends and in our neighborhood a large percentage of horse owners have CAUTION HORSES on the back of their trailer." to add to the bottom of the trailer next! J Maybe thatll give them the hint! 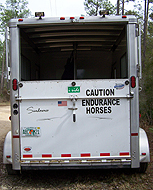 Thanks for providing a quality product that keeps my VERY important equine friend and I safe! 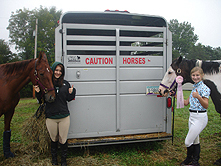 J"
"Went to a horse show yesterday and my class was 3 hrs behind! So ended up with an unplanned drive in the dark back to the barn...so glad I had your stickers on the back of my trailer so my beloved mare and I were safe :) thanks again for a wonderful product!! " 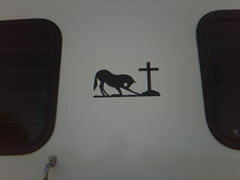 "Thank you so much for the decals. 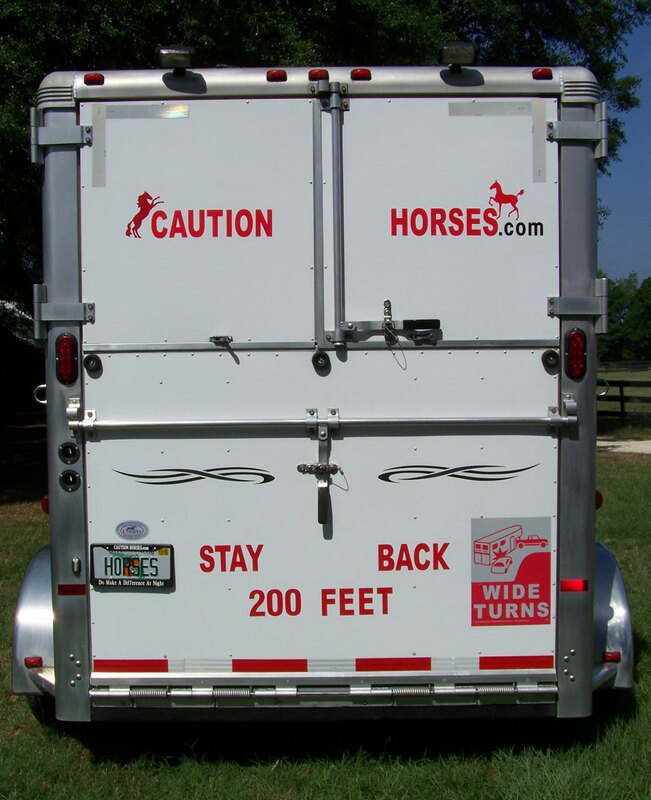 The number of Tailgaters has been dramatically reduced with the addition of the words "STAY BACK 200 FEET""
I am delighted with my new CAUTION HORSES Signs on my trailer. I travel on a very busy, very narrow two lane country road where young men in big pickup trucks drive way too fast and way too close behind. 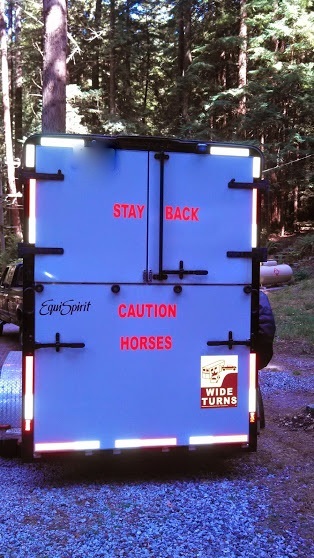 It was so gratifying to put the signs on my horse trailer and notice immediately how they would come up right behind me as usual and then drift back far enough behind me so that I could see them. What a welcome change!!" "It only took me FOREVER, but I finally got photos, found the cords, wrestled with the paint program and can finally send you a few jpegs. They work a great and I'm going to be ordering more stuff within several weeks. 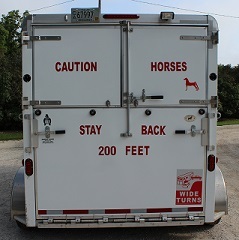 Thanks again,"
"With a big and wide trailer it is always hard to see if a car is following, with our new decals we are letting people know that not only do we make wide right hand turns, but also that if they can't see our mirror's we can not see them. 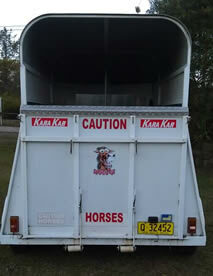 The horse decals are fun, lets people know what we do and the breed of horses we own. 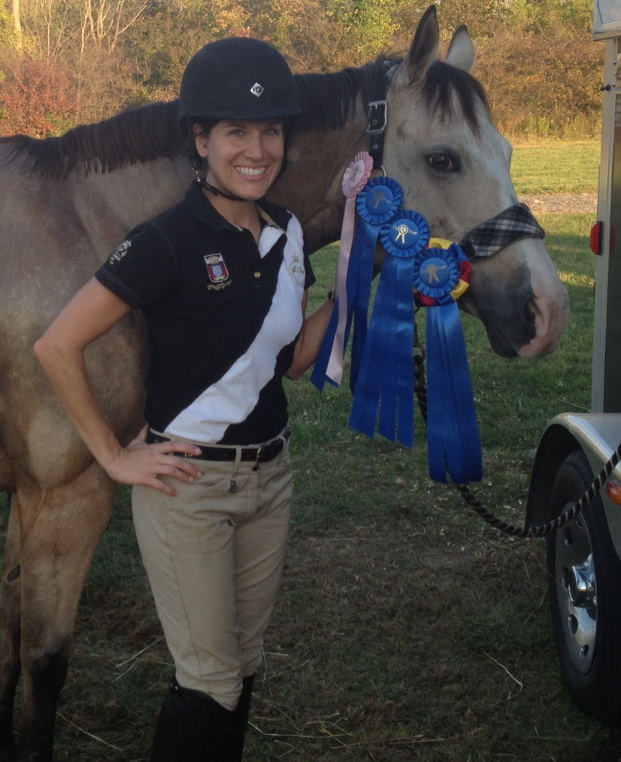 Love the fact that they are reflective." 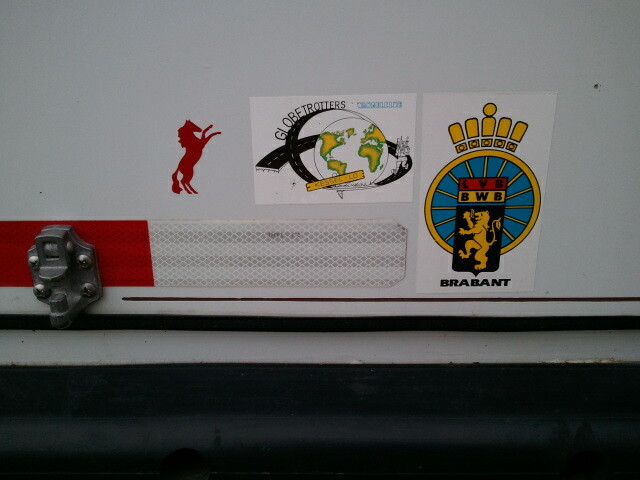 "I love my stickers you sent me! 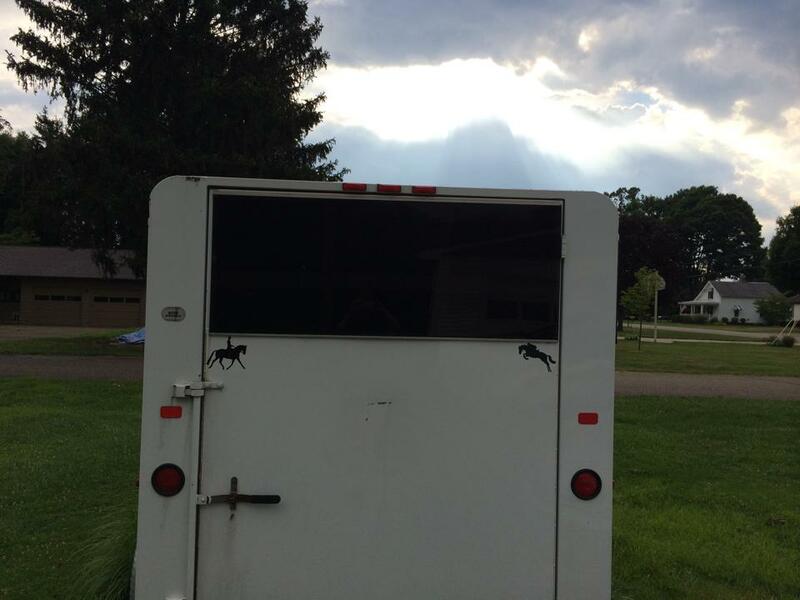 They make my trailer more visible and more beautiful. 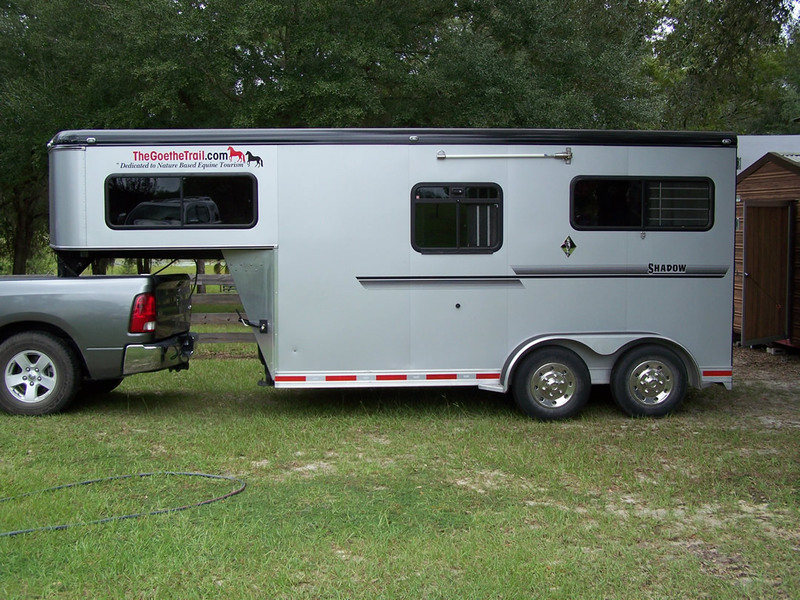 Your stuff is terrific and your customer service is over the top!" 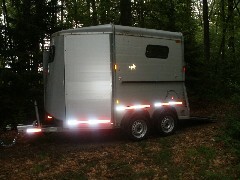 "This is my new trailer getting everyone know I'm hauling precious cargo! 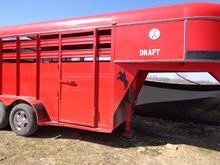 Missouri Fox Trotter's. 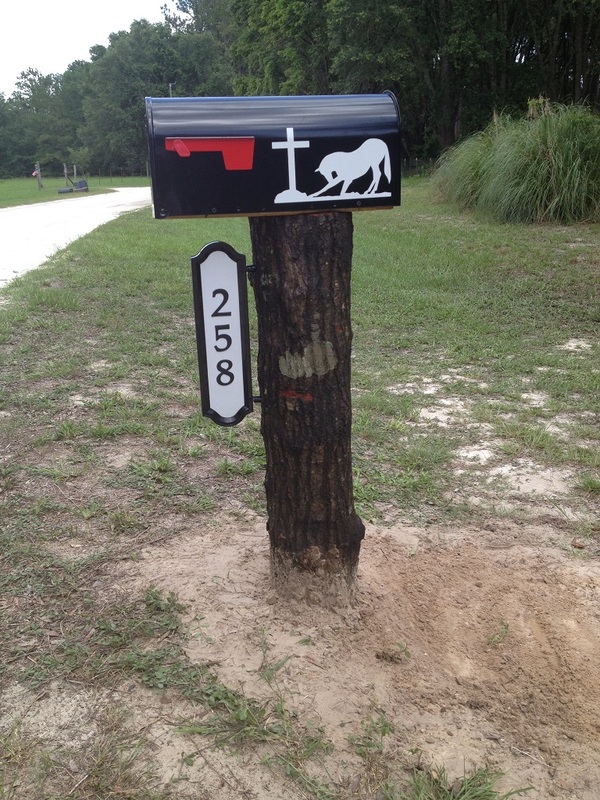 Thanks"
"Here's how we used the triangle caution sign. Thought you'd like this pic. 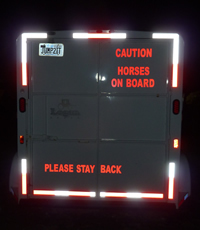 :)"
"Here are some photos I took with your Reflective Strips and CAUTION HORSES sign on my horse trailer. 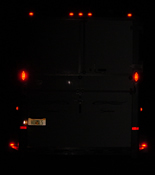 It is parked in my yard and I used only 20 the flash camera....I want to be seen both from behind and when going through an 20 intersection. 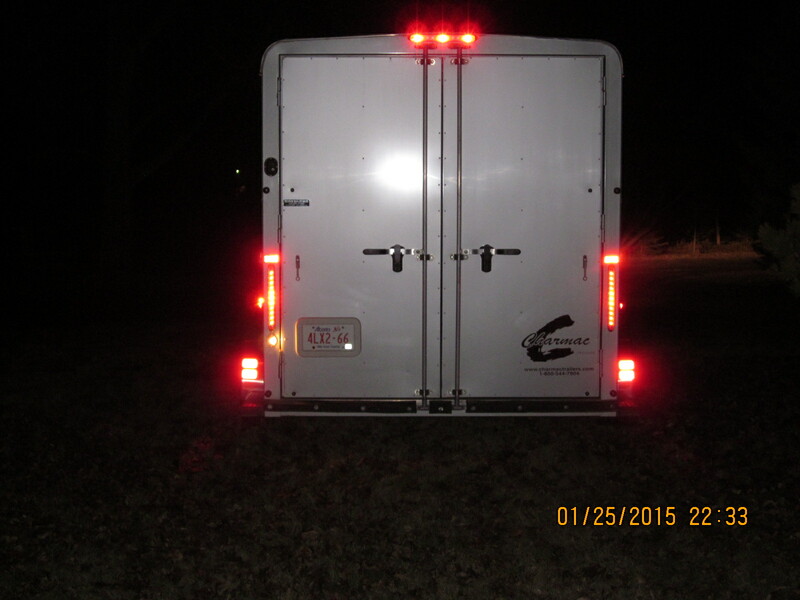 If it shows up this much with just a flash camera - you'll definitely see it on the road!" 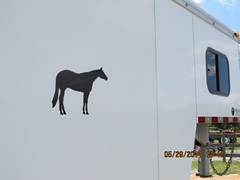 "I ordered several decals from you for my daughter's new horse trailer. They look fantastic! 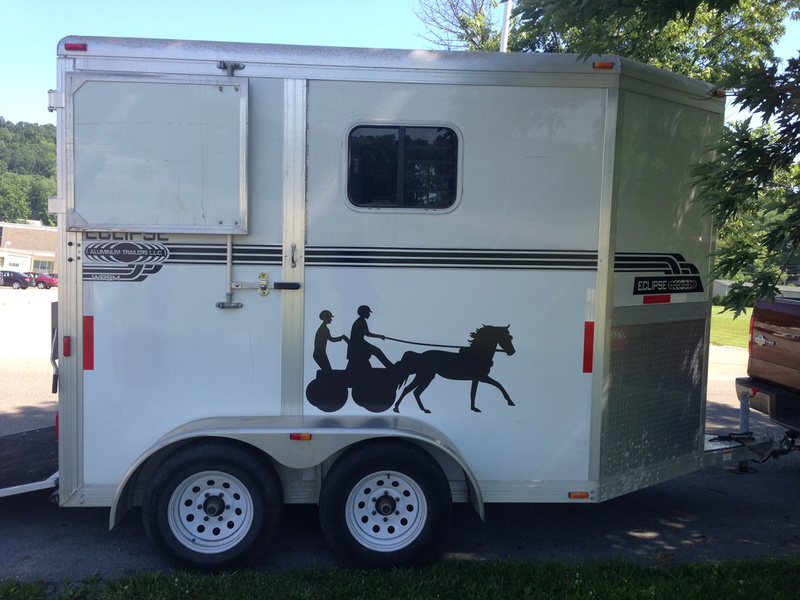 We cannot believe the difference the decals make on the whole appearance of the trailer!" 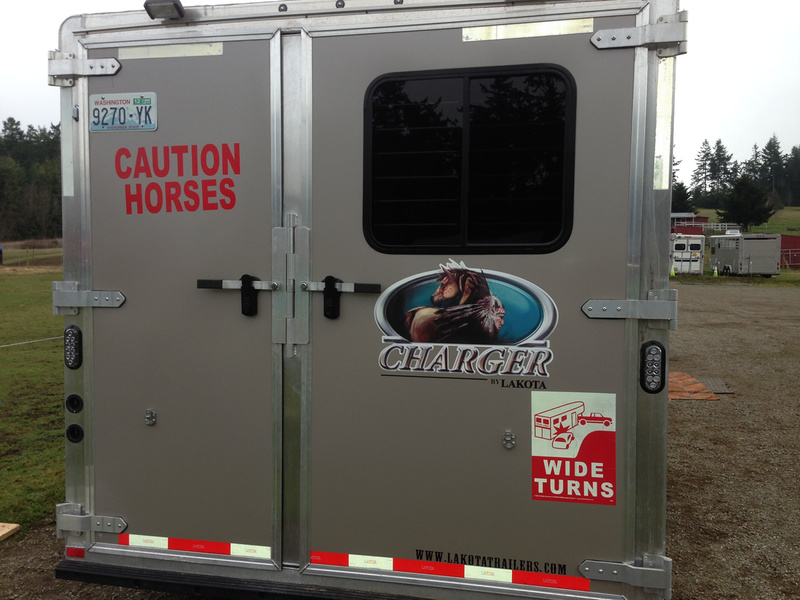 "The decals look great! 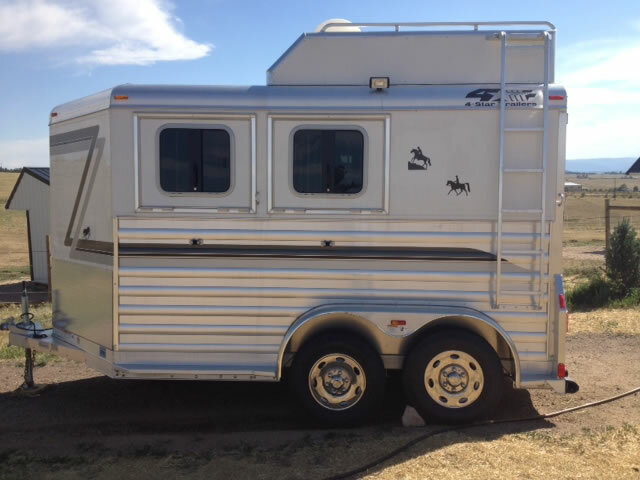 It makes my trailer look like a horse trailer not a box trailer. " 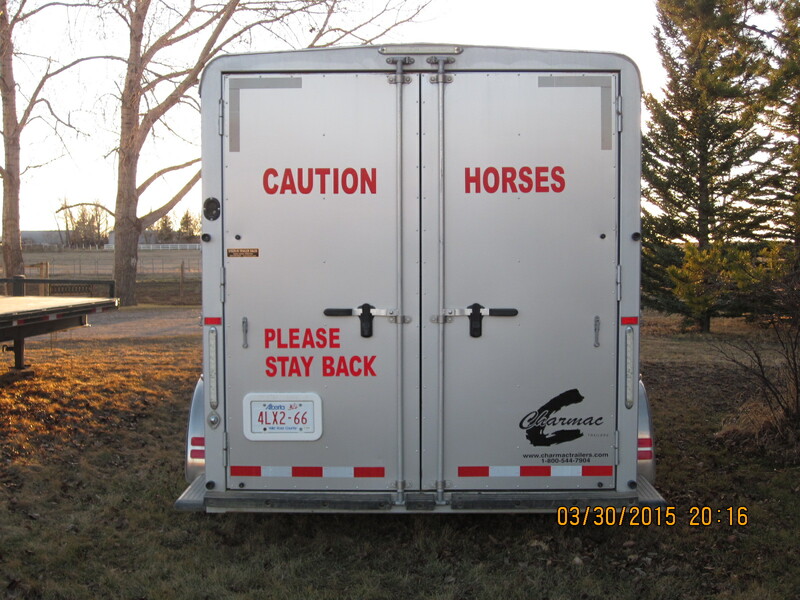 "We purchased a used trailer last Fall and ordered your "CAUTION HORSES" and eventing horse decals right away. 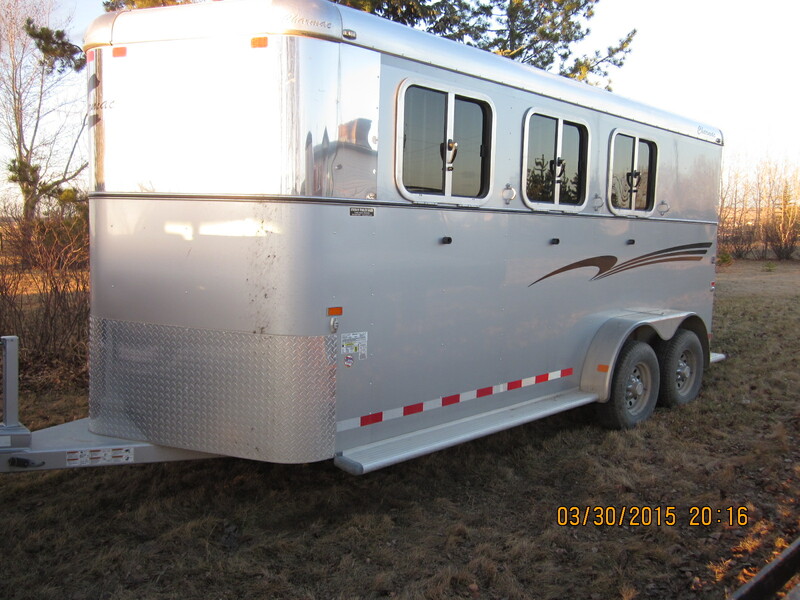 Here are a couple of before and after photos. 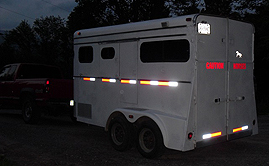 Your reflective decals were very easy to install and I am very impressed with the quality. I look forward to buying more of them for our trailer and will recommend your products to others we know." 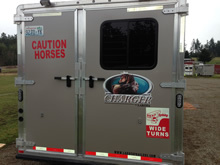 "We recently bought CAUTION HORSES Signs and we wanted to send you picks of the new rig with the decals. 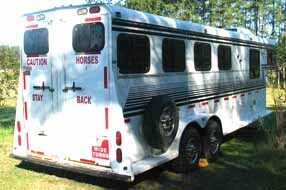 People gave us a lot more room on the road during a long haul to a show 5 hours away. Worth the purchase. Thank you". "Thanks so much for making these great decals! 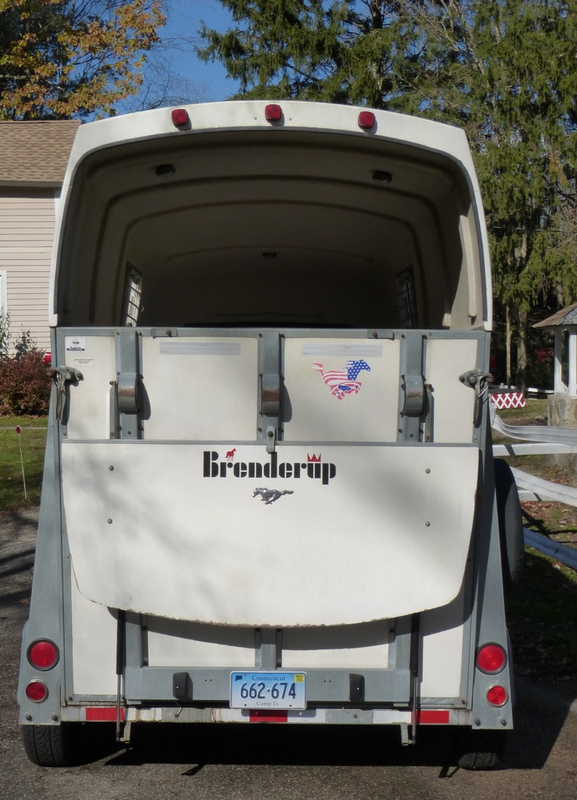 It's the perfect size for my Solo Brenderup trailer--even when I lower the storm door, the decal is perfectly framed. 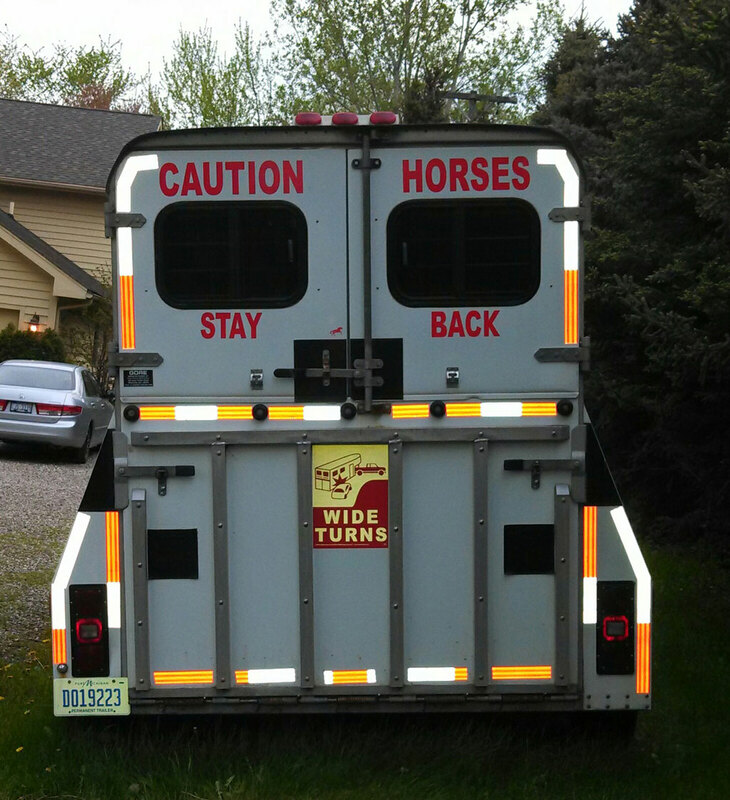 It's big, bright and noticeable to anyone driving behind me. 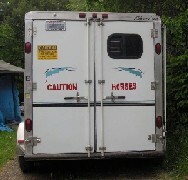 And I appreciate how securely and easily the decal applied--I have no worries that it will peel off. 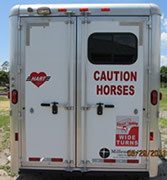 Great product--I recommend CAUTION HORSES.com to all my horse hauling friends!" 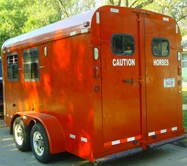 "Your CAUTION HORSES Safety Products™ are absolutely wonderful. 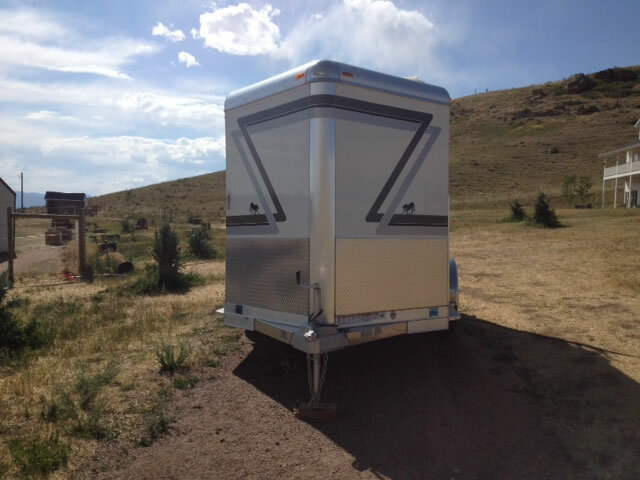 Our trailer can be seen from the road, which is 1000' feet away. 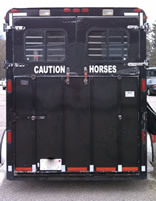 We feel so much safer for our horses now. " Thanks, for a great product. 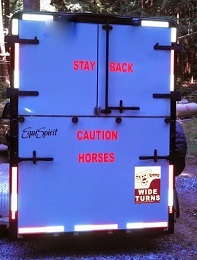 "Our fourth purchase of CAUTION ENDURANCE HORSES Sign, Reflective Decals, D.O.T Strips and WIDE TURNS Sign. 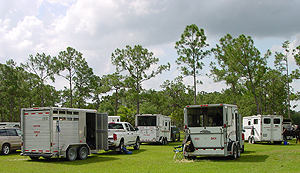 As you can tell from the many photos we are very competitive and have 3 trailer rigs. We would not think of traveling without them. 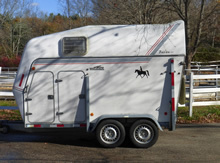 At last we have lost the tailgaters and feel very safe anywhere we go. " "The product looks wonderful on our new Brenderup Trailer. 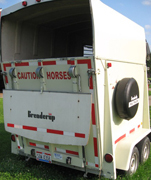 Brenderup Trailers are not the typical horse trailer therefore, some may not recognize it as a horse trailer. 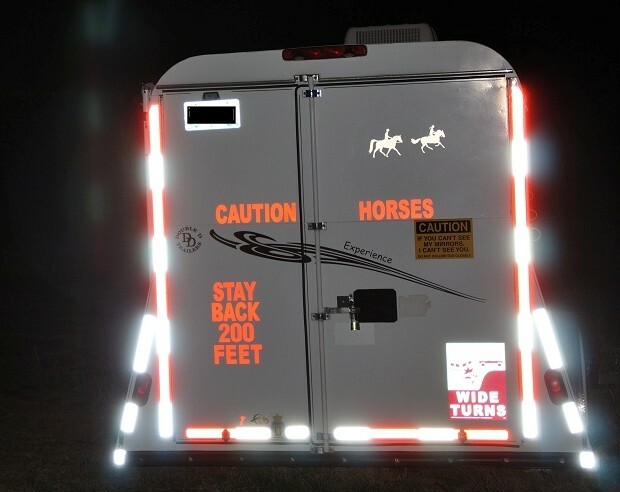 The CAUTION HORSES decal really lights up the rear of the trailer and makes for a safer trip. 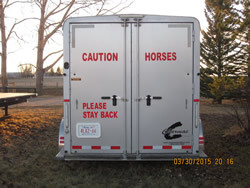 (4" Tall CAUTION HORSES Sign & Reflective Horse Decals)"
"My new trailer with "CAUTION HORSES - PLEASE STAY BACK" on the ramp. 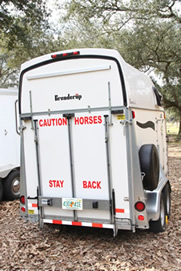 This is the fifth trailer I've put these on, I wouldn't pull a trailer with my horses in it unless these were on it. 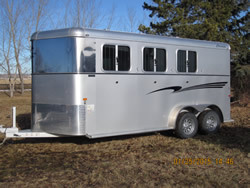 This latest set was ordered the day after I placed the order for the new trailer. 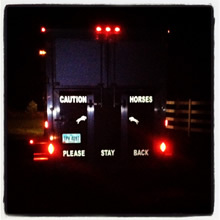 (5" Tall CAUTION HORSES & 4" Tall PLEASE STAY BACK)"
"I probably own the ONLY black trailer in the state of Arizona!! I bought it a year ago, and I've always been worried about driving it at night around town and on the highway. 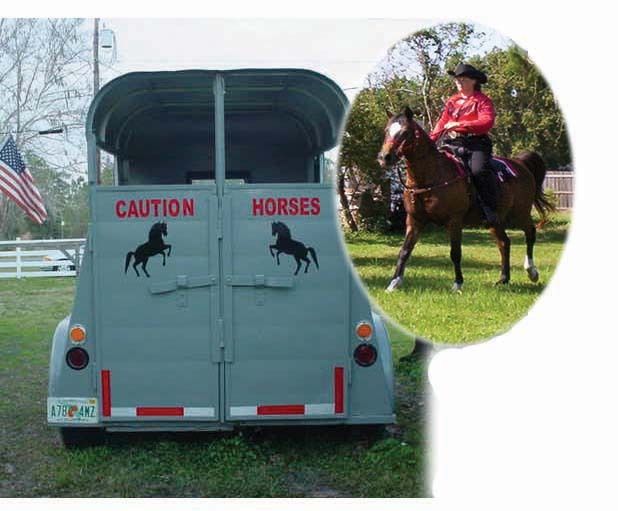 I heard about CAUTION HORSES products when attending a competitive trail ride, and thought I'd look into it. 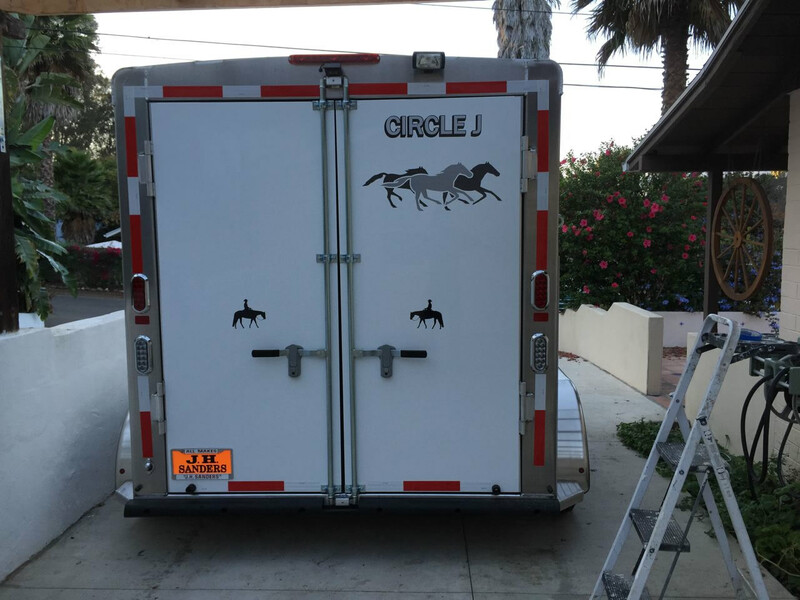 It took me a few months to budget the money for the decals and to decide on which ones to use, but now that I have them I am so happy! 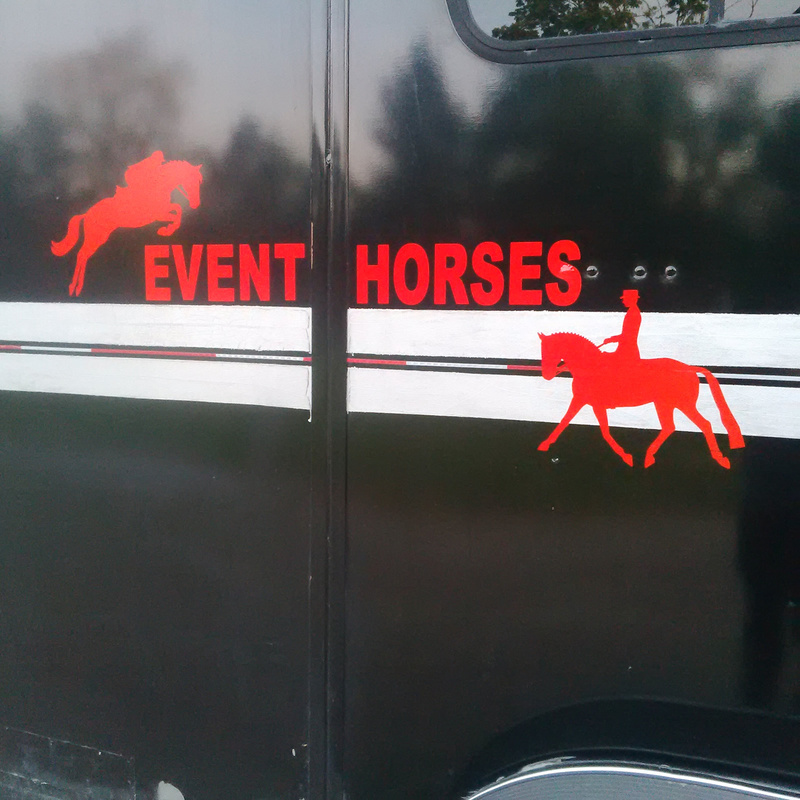 The decals look great, they represent the two sports I am involved with my half Arabian mare - eventing and competitive trail. 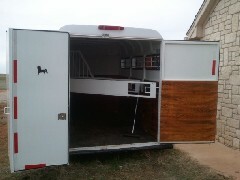 Now I know that people will definitely be able to see me, and plus they'll know it's my trailer! I love your products and your customer service is also wonderful." 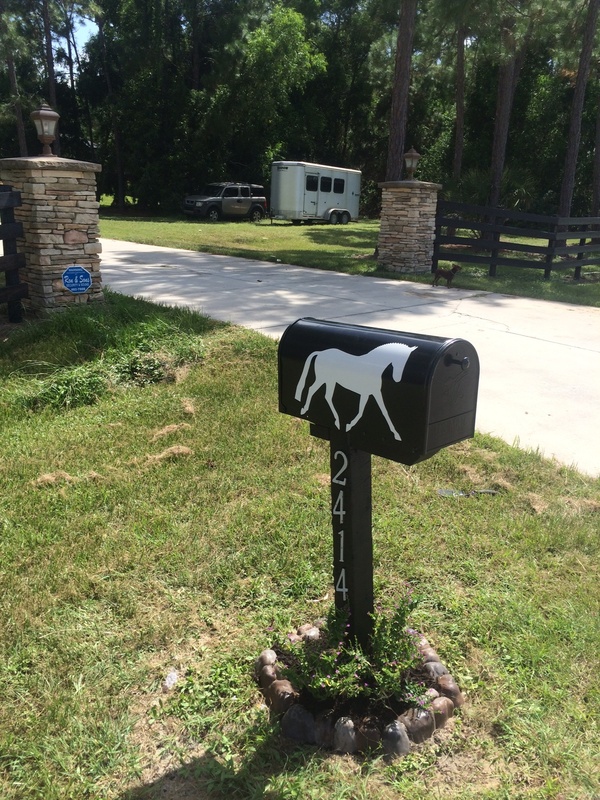 "We are so excited about receiving the decals. We just bought another new trailer that does not have rear windows so it did not look as much like a horse trailer. 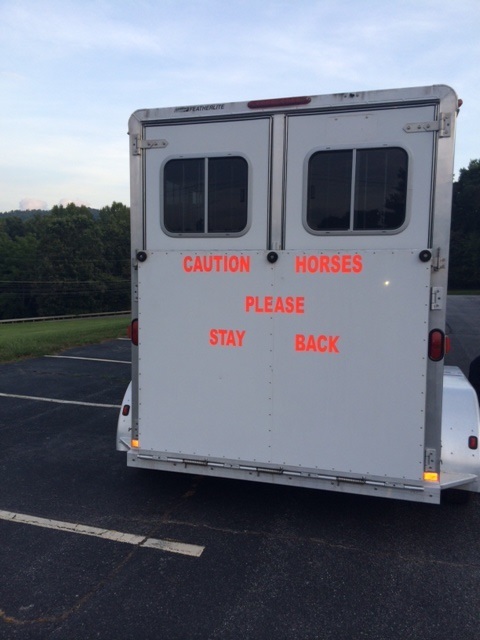 After putting the decals on we, and the horses, feel MUCH safer now that vehicles behind us will know there are horses on board. We are so glad we found your web site." 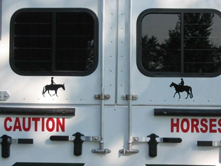 "I absolutely LOVE my new decals. They were very easy to apply and they look FABULOUS. 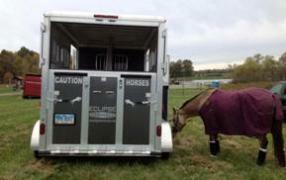 Now, I feel so much safer trailering my horse, (the love of my life) on the road. Thanks for such a great product. I will be ordering more. 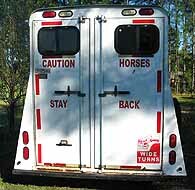 I purchased the 4" Tall CAUTION HORSES, Wide Turns, Horse Rider facing Left, and the Don't Follow to Close" decals in RED." 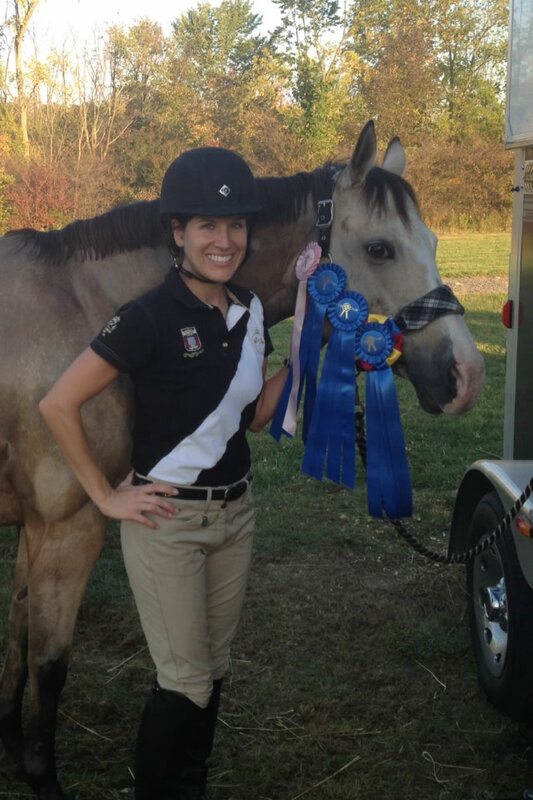 "Your products, to me, are life savers! 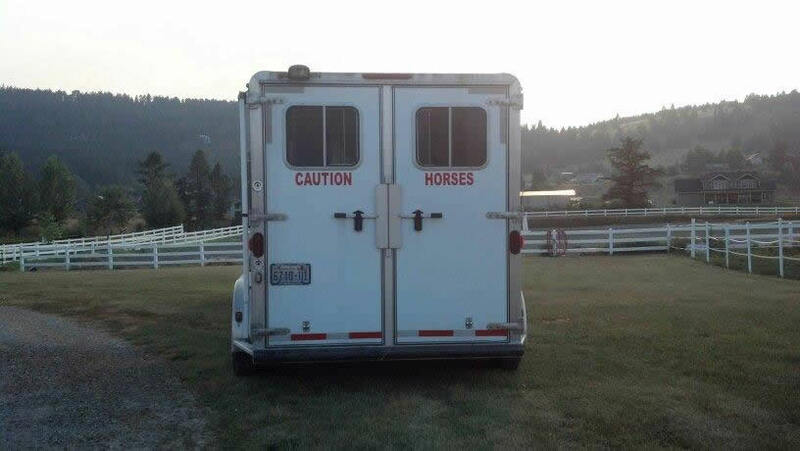 As a business owner and marketing specialist, I can say that the CAUTION signs are more professional, so they catch the eye while driving. The other signs on the market seem to be more passive, thus not grabbing driver's attention. Also, the D.O.T. 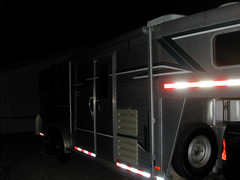 approved strips make my trailer glow! 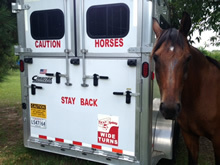 All in all, your company has an excellent product and on top of that, you are helping to keep my horses and I safe. Thank you." "This is my partner Dpty, Wyatt Erp with OCSO in Michigan. 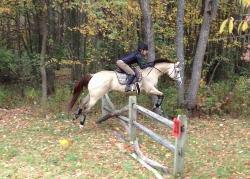 He is a 10 year old Appaloosa Gelding. He is wearing CAUTION HORSES Reflective Leg Lights. 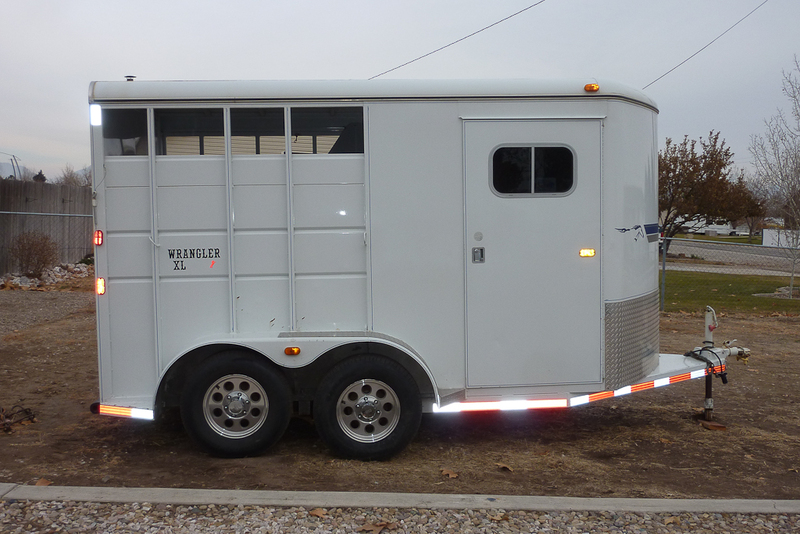 I have purchased these same Leg Lights for several years now and have hopefully gotten approval for them to be ordered for our entire unit for next year. These Leg Lights are the only ones I feel do what I need them to do. 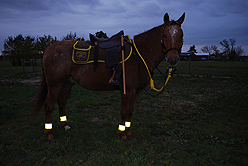 They make my horse highly visible even with very minimal light. 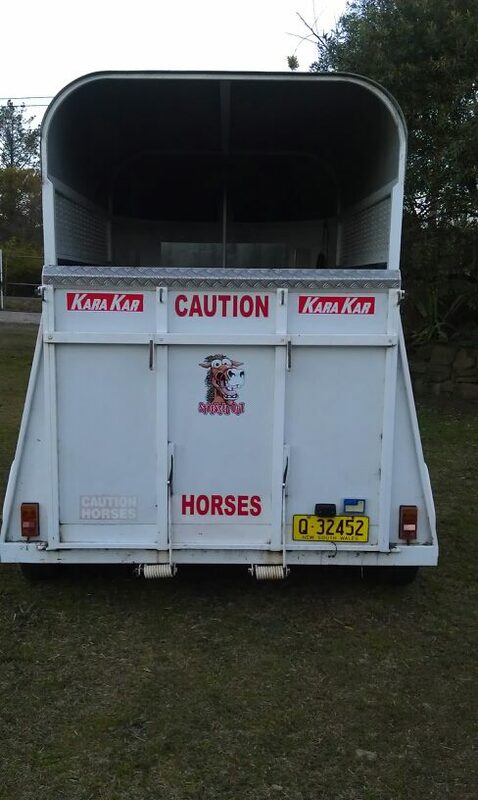 I won't trust my horses safety to any other product. 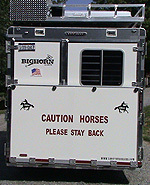 Thank you CAUTION HORSES for a safe, practical and high quality product." 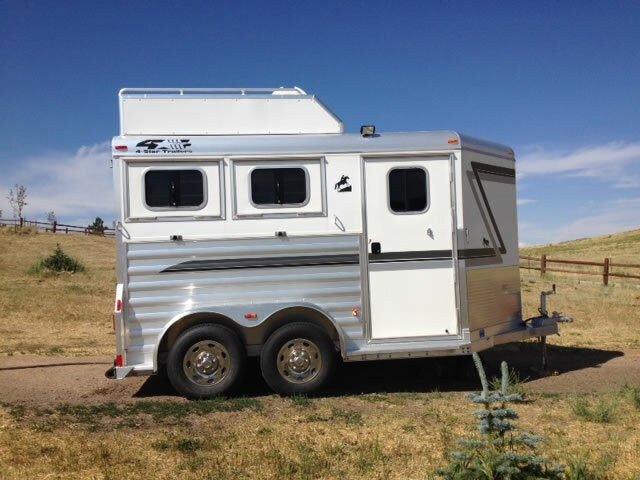 "It was very easy to put on, and it's just perfect! 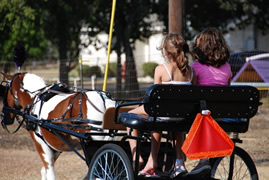 We plan to now buy a big horse, if only the girls can agree on which one!" 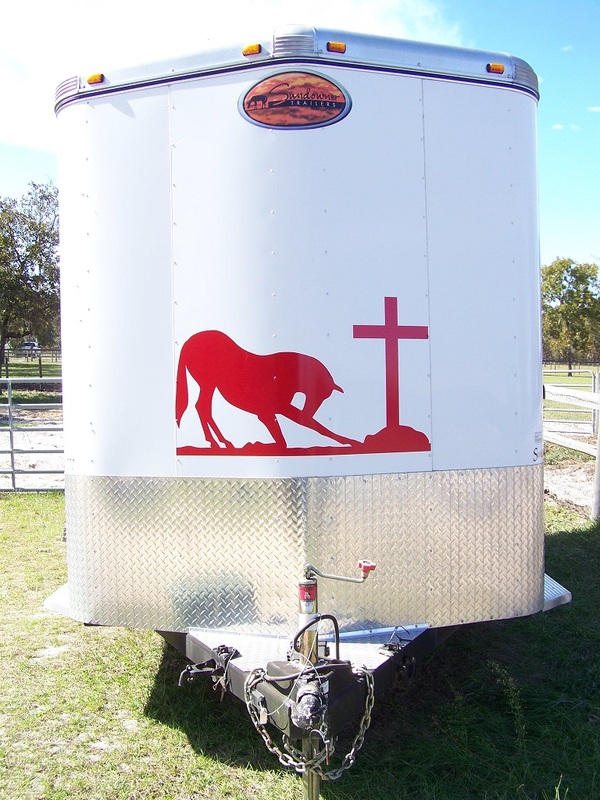 "I just wanted to let you know how thrilled I am to finally have your decals on my horse trailer. 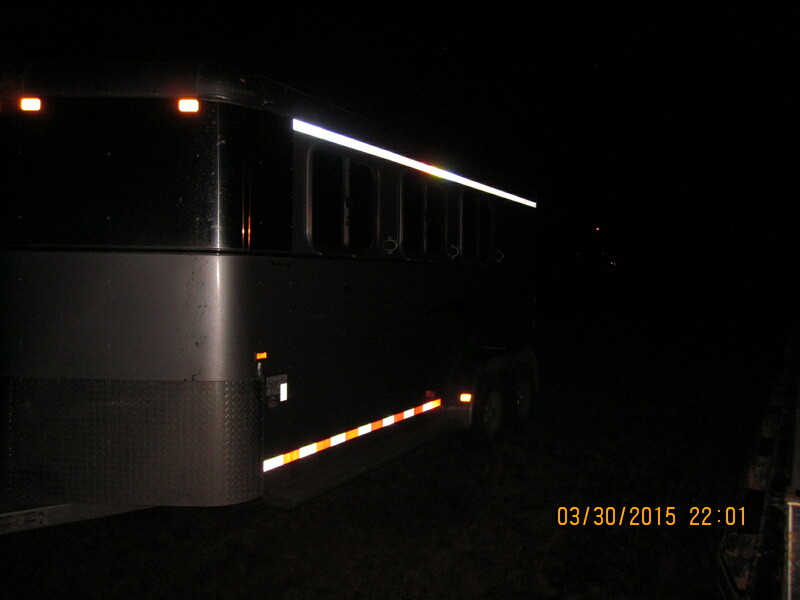 I feel much safer about hauling my horse after dark, plus it made my "mature" trailer look much flashier! 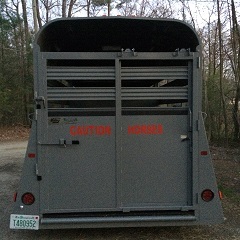 A friend reminded me to put some decals inside the back doors of the trailer - in case of emergency, the open trailer doors would hide the tail lights on my truck." "I recently purchased my second set of CAUTION HORSES stickers. 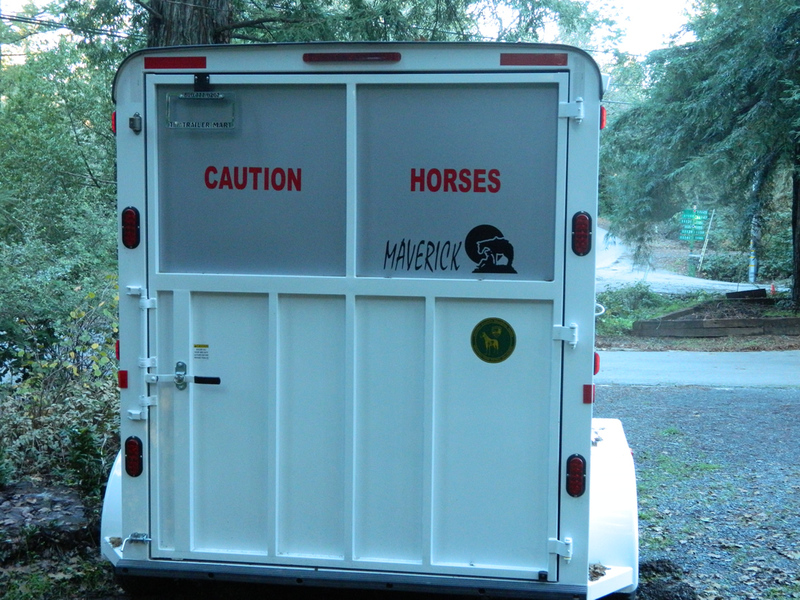 As soon as I upgraded my horse trailer, I ordered new stickers right away. I didn't want to travel out of state without being very visible, especially at night. 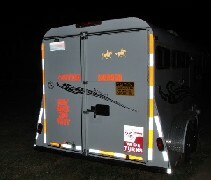 The stickers look great and are highly visible both day and night." "We became clients in 2007 and when we bought a new trailer in 2009, the first thing we did was put CAUTION HORSES sign and Horse Decals on the trailer and we love it". 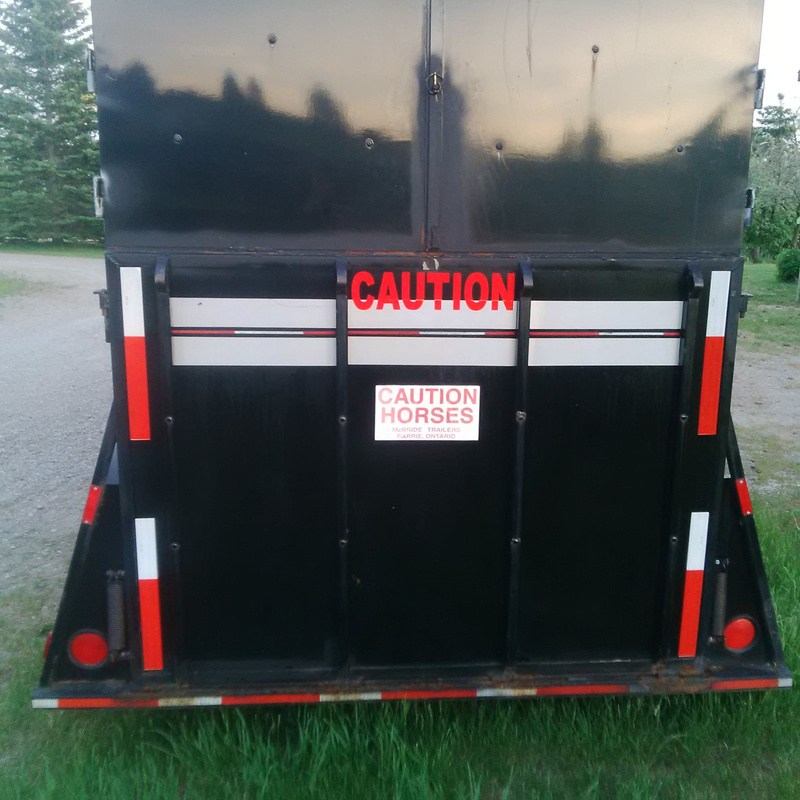 "I just put my new "CAUTION HORSES" signs on my freshly repainted trailer - they look great, were easy to apply, and are very visible. Thanks for making such a quality product. " 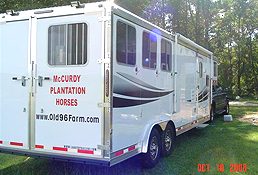 We will be hauling Doodle Dee McQue, registered American Paint in our New 2008 Eclipse horse trailer with CAUTION HORSES Safety Products™ Sign & Decals. 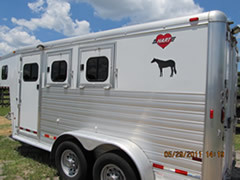 "I received my decals today and promptly put them on my 2008 Eclipse aluminum horse trailer. 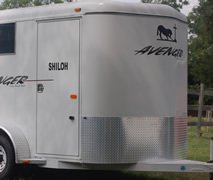 They really look good and compliment the trailer." 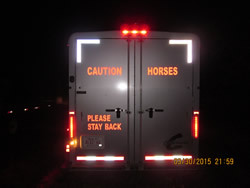 "I want to thank you all for marketing and selling the Caution Horse sign. 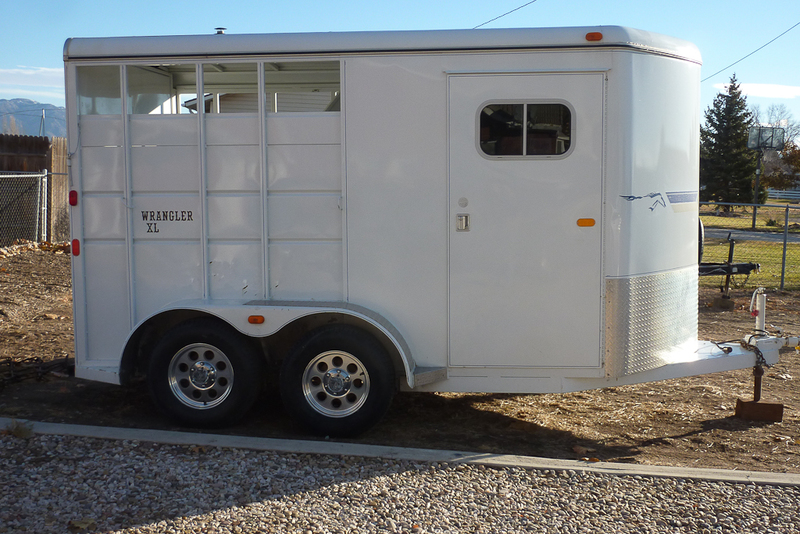 My horse trailer is a Brender Up, which always gets a look like "what that?" 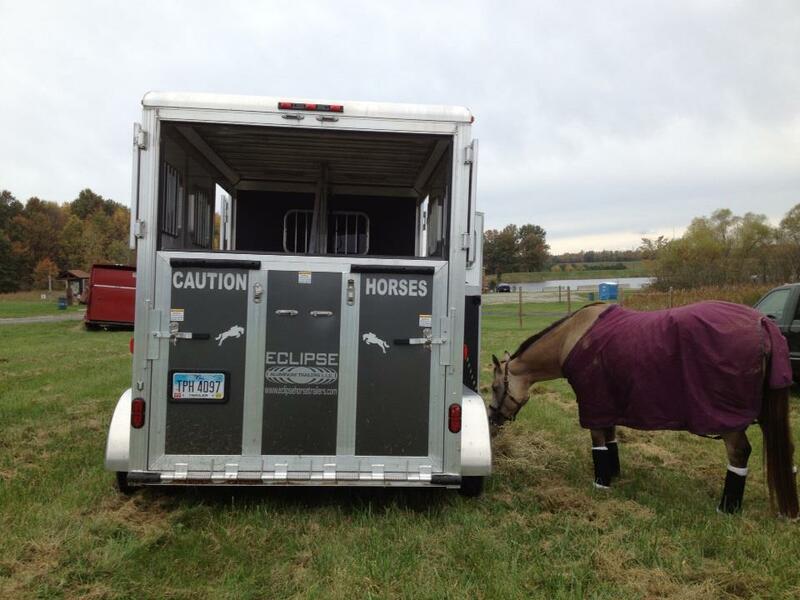 so your sign lets people know that I am trailering an important cargo! 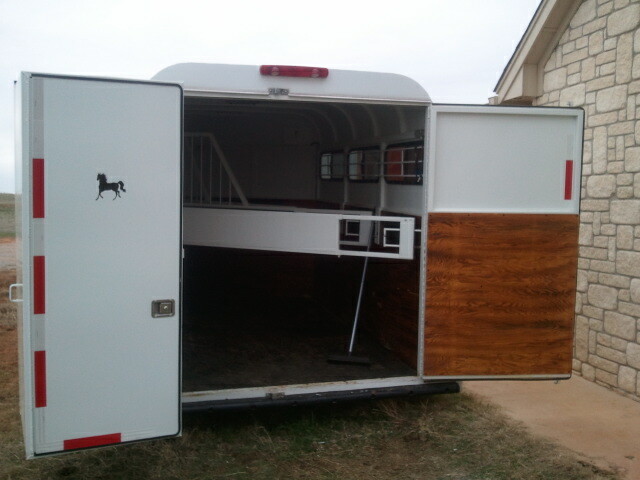 It also looks great on my trailer. Thanks again!" 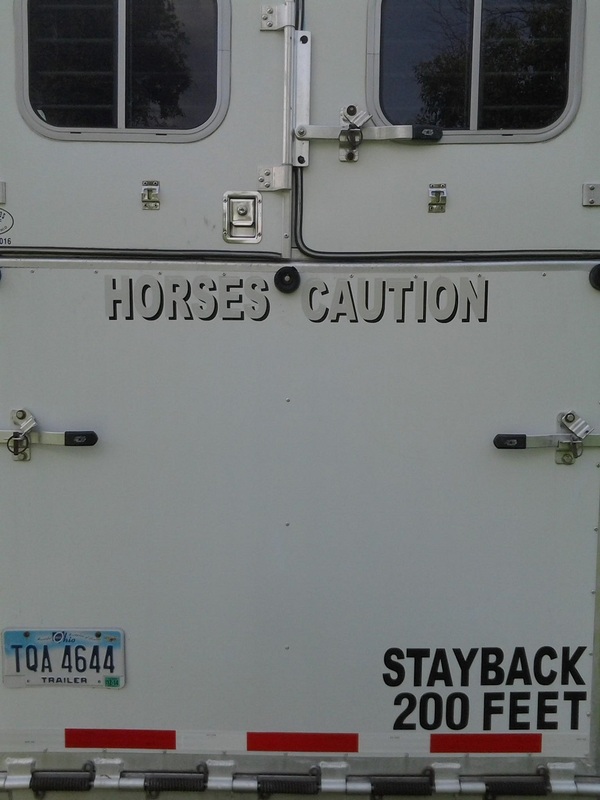 I get a ton of compliments on my CAUTION HORSES Decals and people are always wanting to know where they came from. 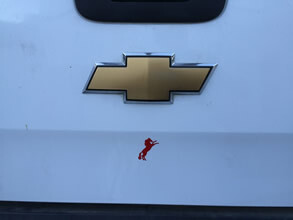 They give my truck its "Finishing Touch". 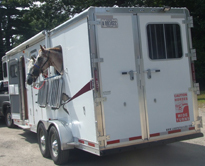 "Before driving down the highway you couldn't tell that my horse trailer was a horse trailer from behind. 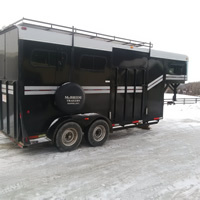 Now I'm letting people know that I have horses in the back of my trailer and I see a difference in other drivers respecting my trailer and staying back." 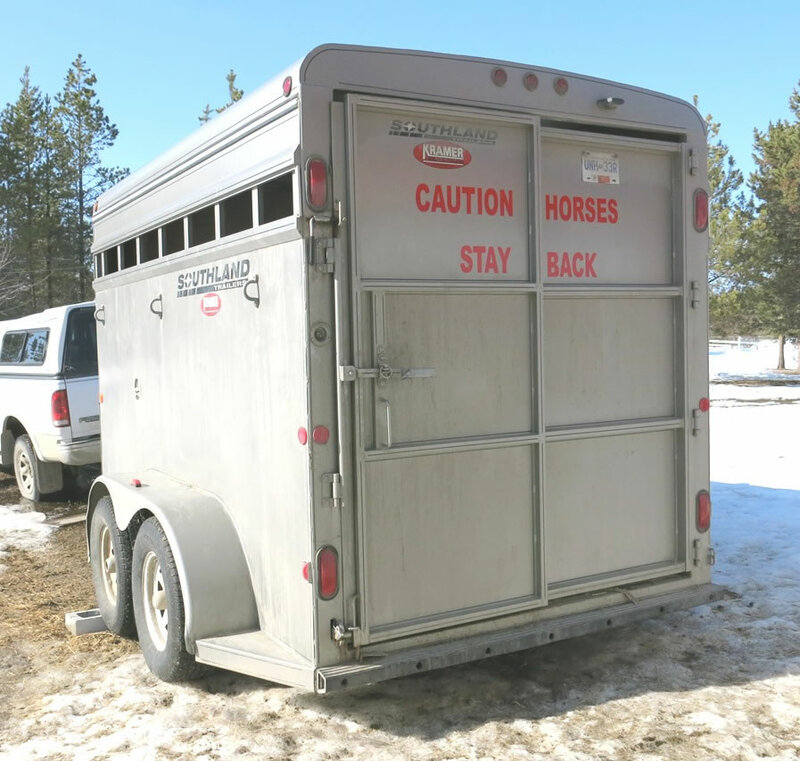 "I love the product and my horses love the product, the signs are professional, step-by-step instructions and I have noticed other drivers staying off my trailer more." 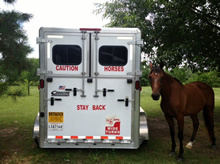 "I've known Deborah since she started CAUTION HORSES; it has been wonderful to watch her business grow, creating all the different safety products. 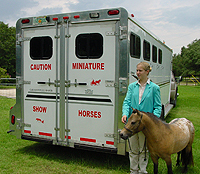 If she wasn't sure about a breed's confirmation or riding style she would ask an expert in that breed/discipline to review the Horse Decals, before they were produced. 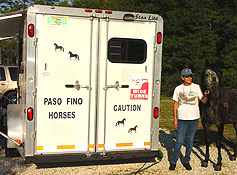 I helped create the Paso Fino Horse Decal. 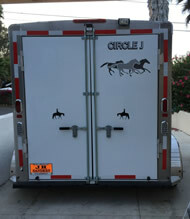 I appreciate her having "correct" decals for a Paso Fino when I drive down the highway - they are not easy to find; what a great looking way to make sure everyone knows I have horses in my trailer! 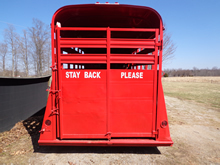 This is my second trailer with CAUTION HORSES all over it - I wouldn't use anyone else, because I know the quality of the product." 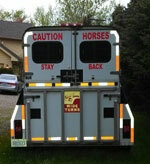 "I get a lot of comments and compliments about our horse decals that are displayed on the mobile unit. 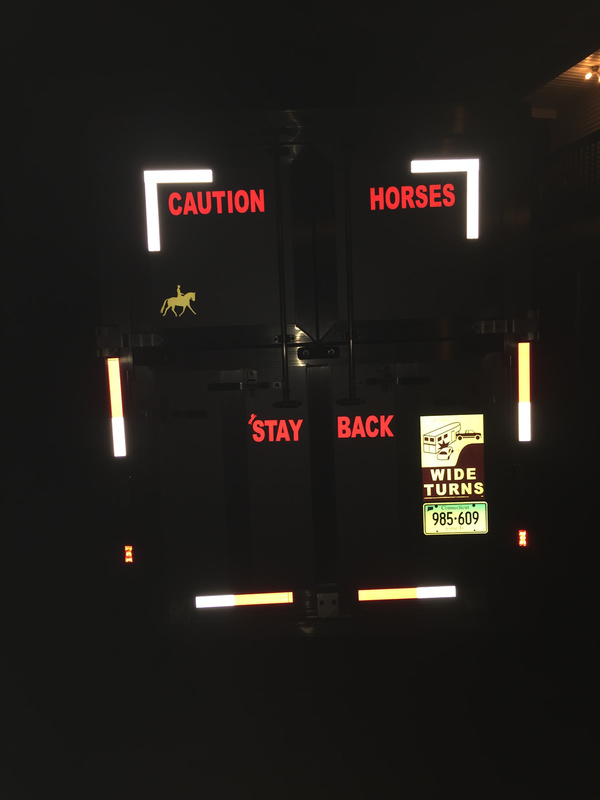 We have done a few shows that have went into the evening hours and with all the headlights hitting the trailer, you can really see how well they are visible at night. 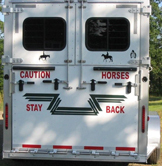 I am pleased with the Horse safety decals for my personal use as well as carrying them in our mobile tack store. 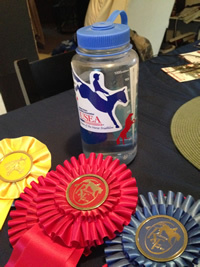 I have sold some at every show I have attended." 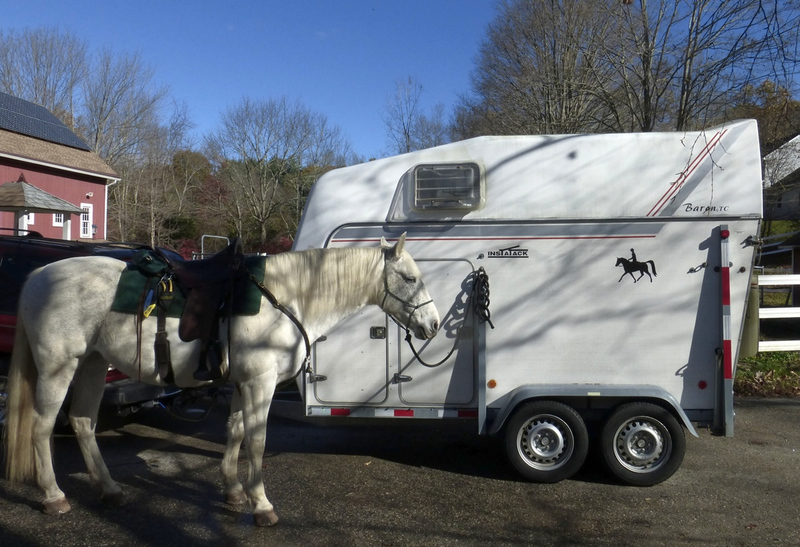 "It is really important for me to keep my horse, Memphi, safe when hauling on riding trips. 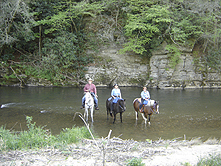 I am primarily a trail rider and love to ride with my husband and friends. 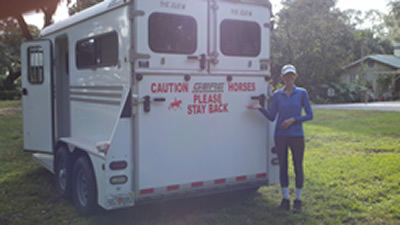 Thank you so much for what you do for the horse industry and I hope others will use your CAUTION HORSES products to insure the safety of their beloved companions." 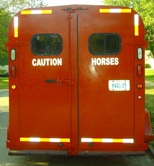 " 4" Tall CAUTION HORSES Sign & Reflective Horse Decals"
"I believe that CAUTION HORSES Signs & Decals are a must for every horse trailer." for Great Britain & U.S.A.